This posting was prepared before “Irene” came through and I am sending it off from our vacation spot in Canada. Anna, who is holding the FEP fort in Harlemville, assured us that, although there was flooding at Hawthorne Valley, it was not as extensive as two years ago and has all receded by now. Sorry, no pictures from the flood, because we were not there to witness it. 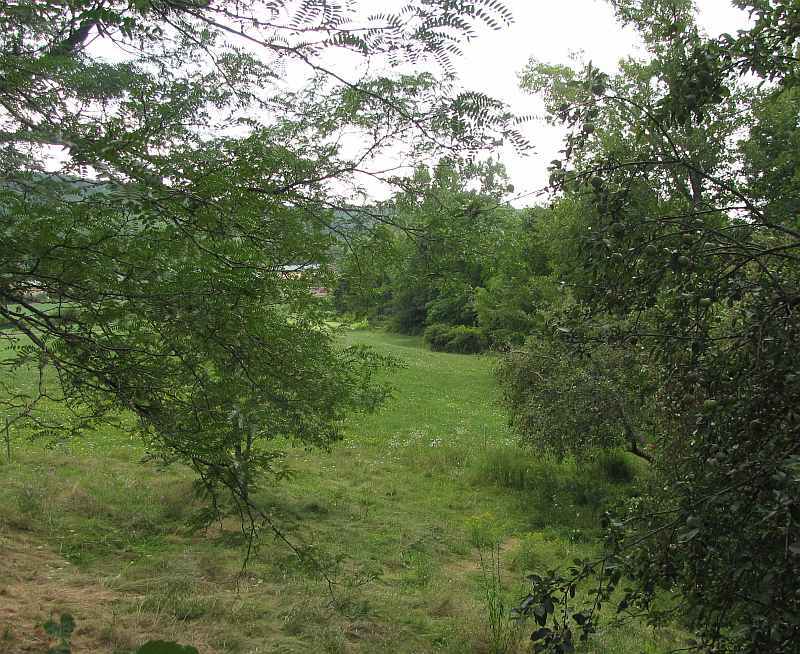 However, this blog is about the corridor along the farm creek: For at least six years now, the corridor along the farm creek from the pump house to the cattle crossing has not been grazed. The cows were fenced out and the vegetation was left to develop for a while, to see what would come up. 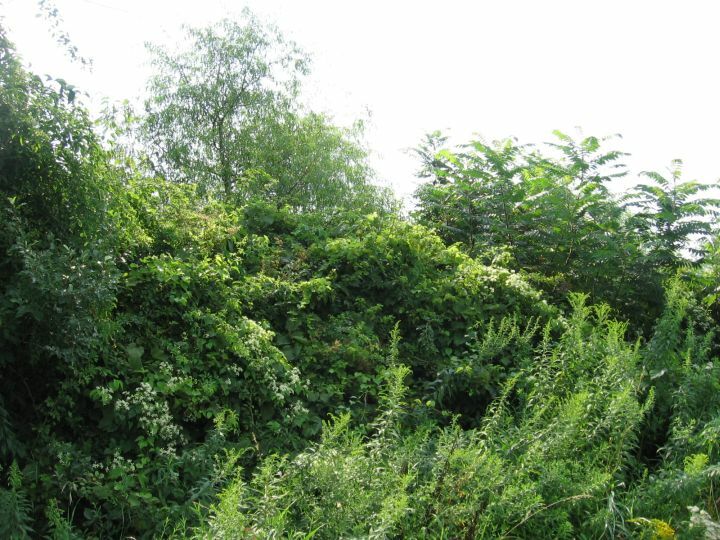 The invasive multiflora rose got a bit more common than desired and removal of this aggressive species in the creek corridor has begun last year. 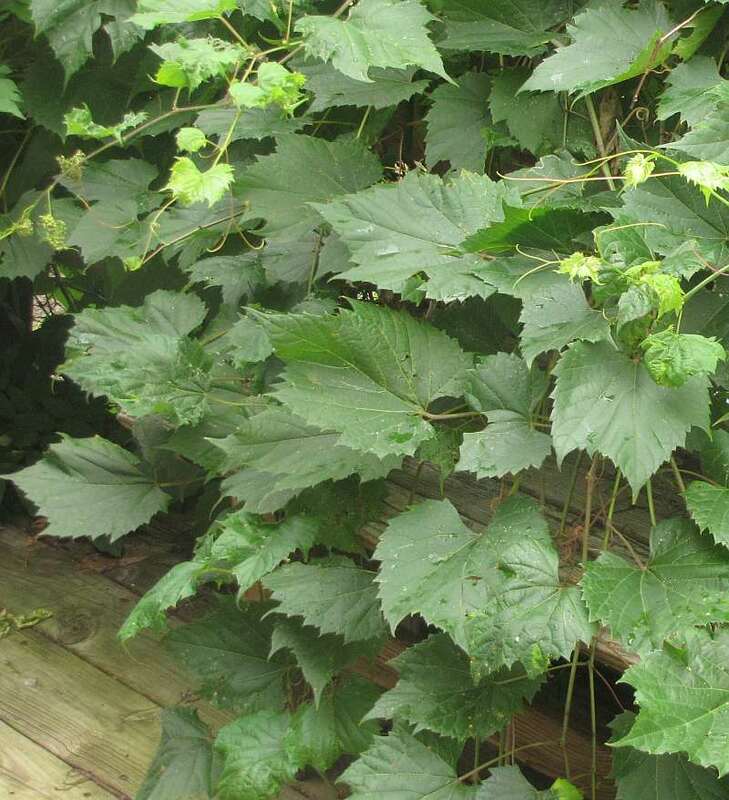 A few other invasive species are present in smaller amounts and might need to get discouraged in the future. 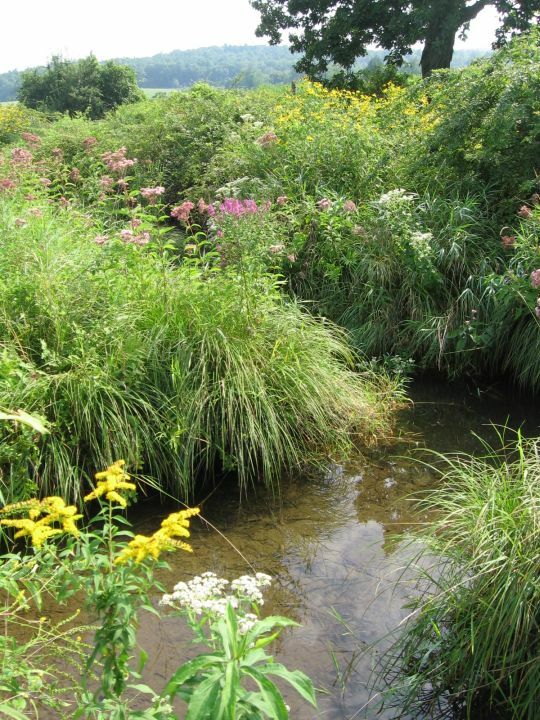 Other than that, we are pleased to see many native shrubs and wildflower species thriving along the creek, creating a structurally and botanically diverse habitat that attracts a lot of insects and birds, protects the creek from surface runoff, and begins to shade sections of the creek. 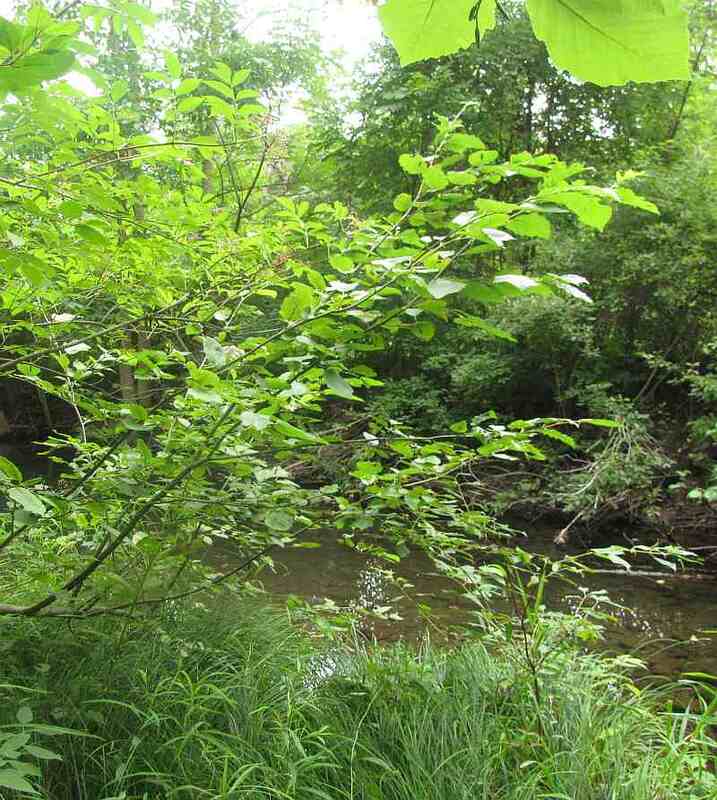 Here is a mid-summer inventory (pictures mostly by Lauren McDonald) of the colorful and vibrant habitat that we now find along the creek. A view from the edge of the water with the native Agrimony, Goldenrod and Boneset flowering on the shore in the bottom left corner, the native Tussock Sedge growing along both shores, the invasive Purple Loosestrife flowering in the center, surrounded by the native Joe-Pye-Weed, Coneflower and more Boneset. A view from the “outside” of the corridor. 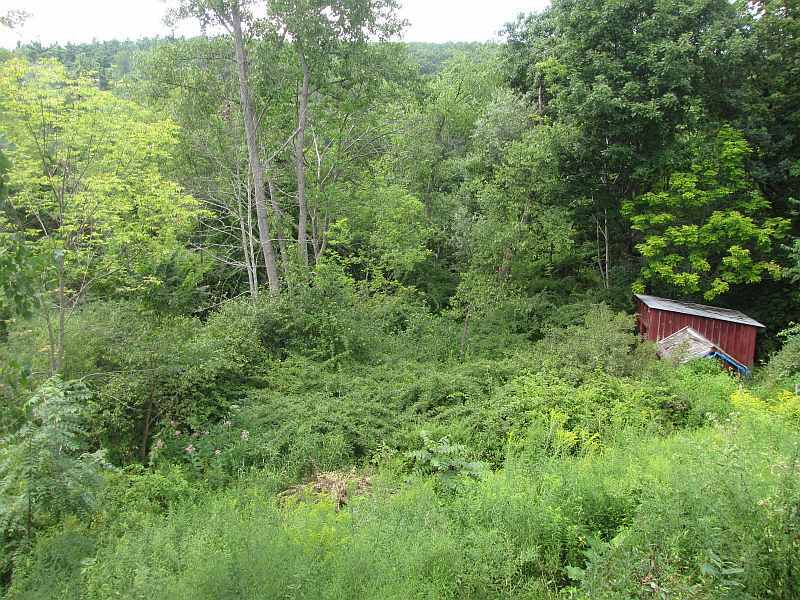 Amongst the woody plants in the background (near the stream) are native Willows and Sumach, and the invasive Multiflora Rose which is overgrown by the white-flowering native Virgin’s Bower. 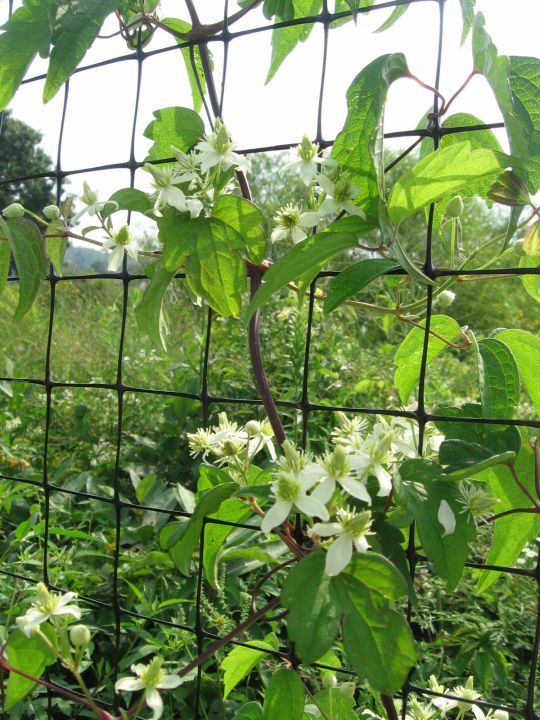 Virgin’s Bower also takes advantage of the deer fence surrounding the vegetables in the “main field” just west of the creek. 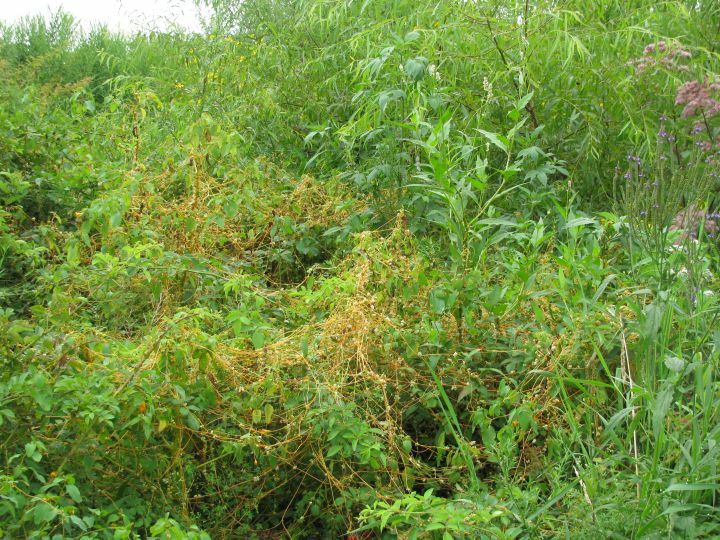 Some sections are overgrown by this orange, spaghetti-like plant called Dodder. 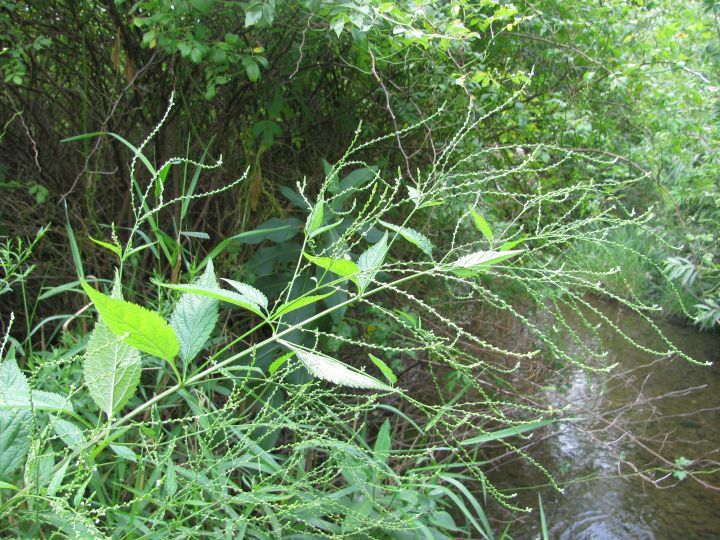 Dodder is a native, parasitic plant that does not bother to grow leaves or any other green tissue and can not photosynthesize. 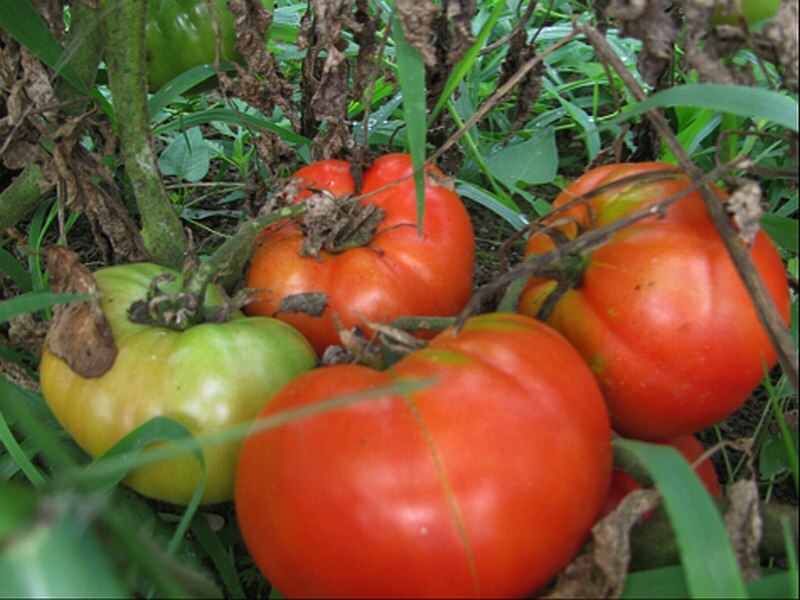 It steals nutrients from other plants by tapping into their roots. It thrives in many wetlands throughout Columbia County. Another type of climbing plants (though not parasites) in the farm creek corridor are the two species of Tear-thumb. 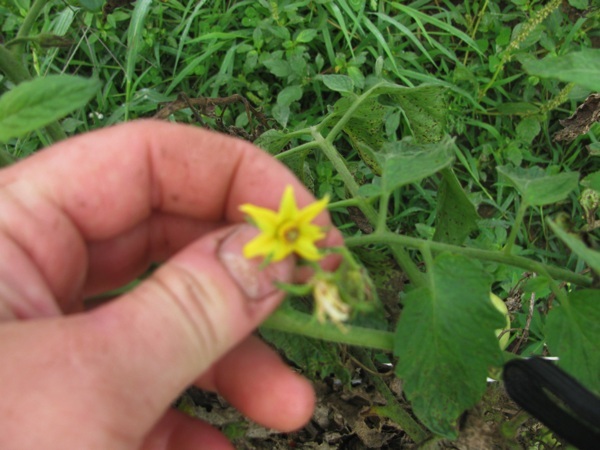 You’ll know them when you touch them, as the recurved hooks along their stalks (which come in handy when they try to get a grip on other plants) do just what their name suggests: tear thumbs… The picture above shows the more common Arrow-leaved Tear-thumb, and the picture below the rarer Halbert-leaved Tear-thumb. Both Tear-thumbs are members of the buckwheat family (which also includes knotweeds and smartweeds) and are characterized by clusters of tiny, orchid-like flowers in shades of white to pink. 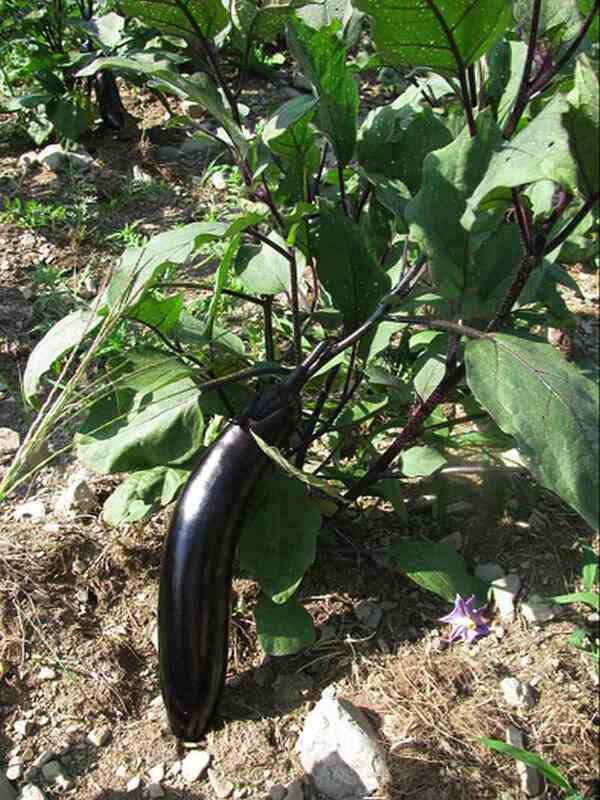 Bittersweet Nightshade is a non-native climber related to tomatoes, potatoes, eggplant and peppers. 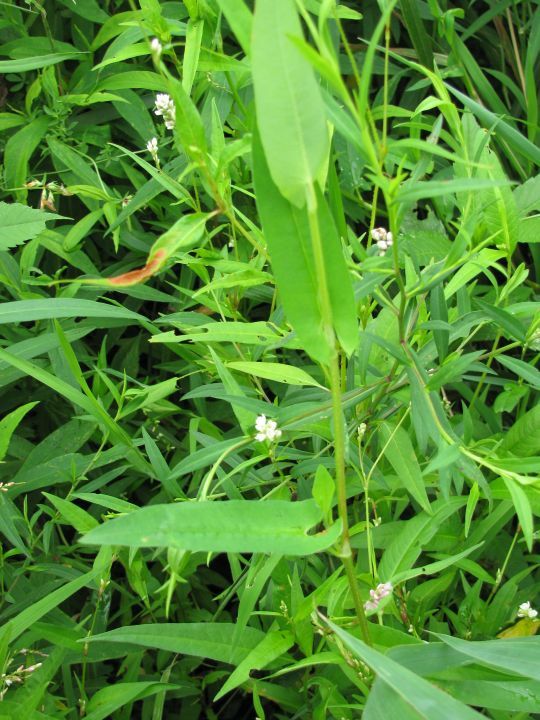 It thrives in many of our wetlands and also can become a weed in vegetable gardens. 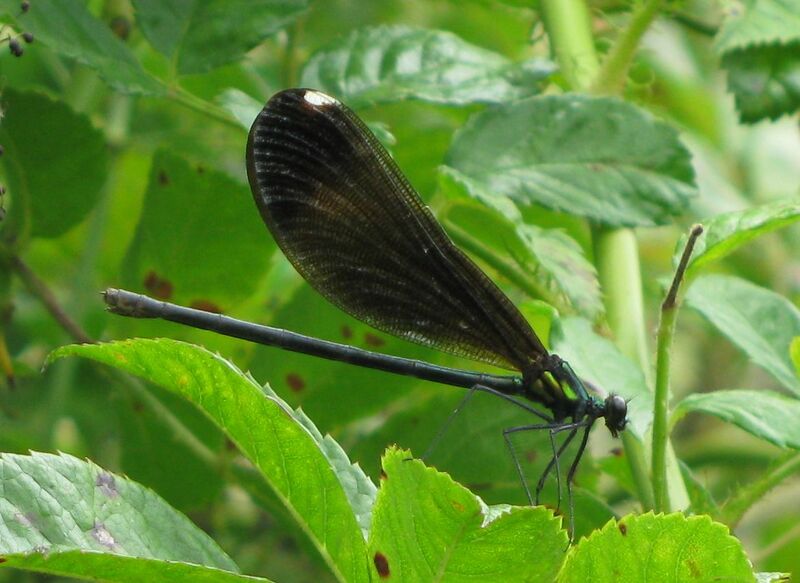 One of the most conspicuous insects along the farm creek is the Ebony Jewelwing, a damselfly. 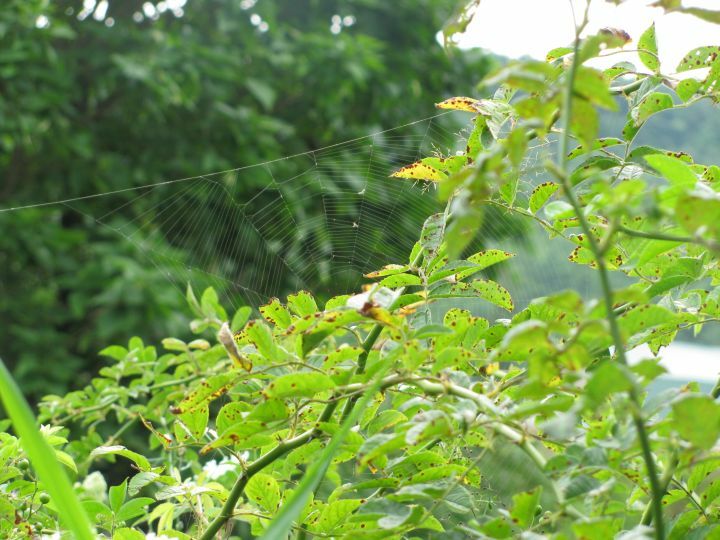 Its larvae are aquatic, like those of many other insects, and the adults are often seen hunting for flying insects along creeks. 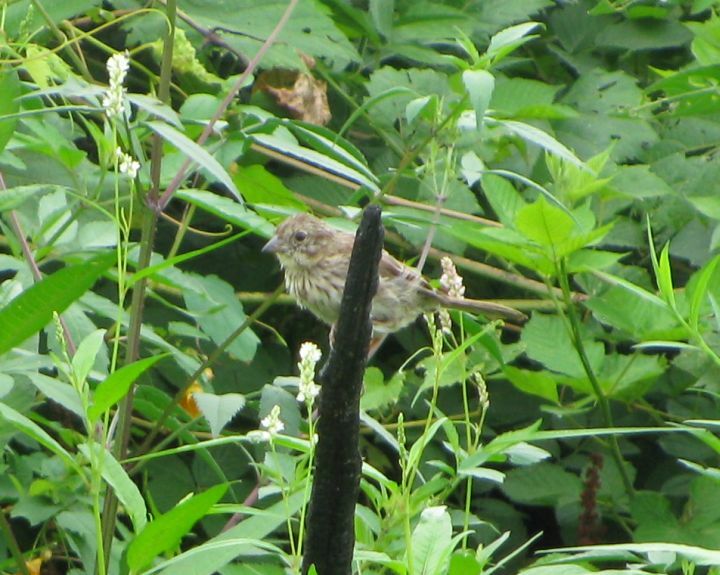 We don’t know if this little sparrow actually had a nest in the farm creek corridor or was just visiting to check out the food situation. 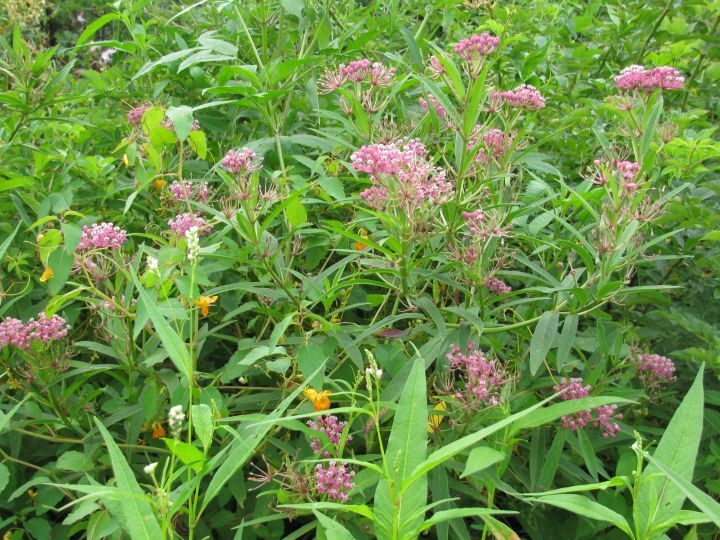 Swamp Milkweed (big pink flower clusters) is an important nectar plant and also host to the caterpillars of monarch butterflies. 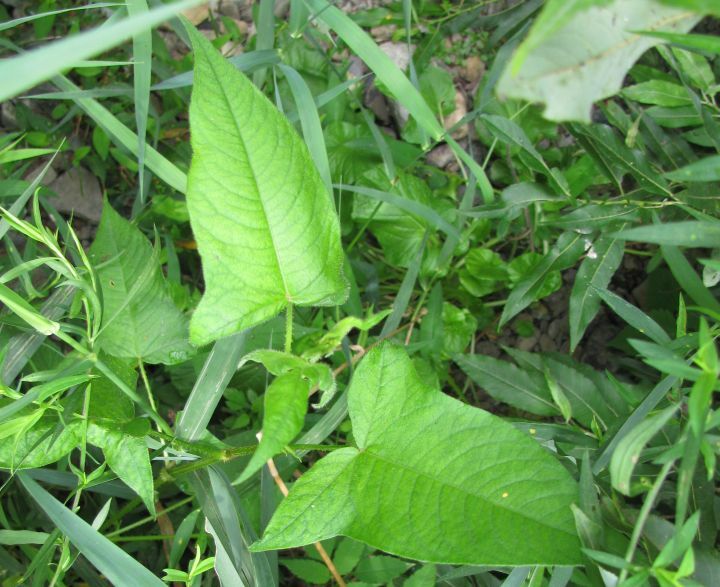 Here it grows intermingled with Spotted Jewelweed (orange flowers) and Dock-leaved Smartweed (white flower clusters). 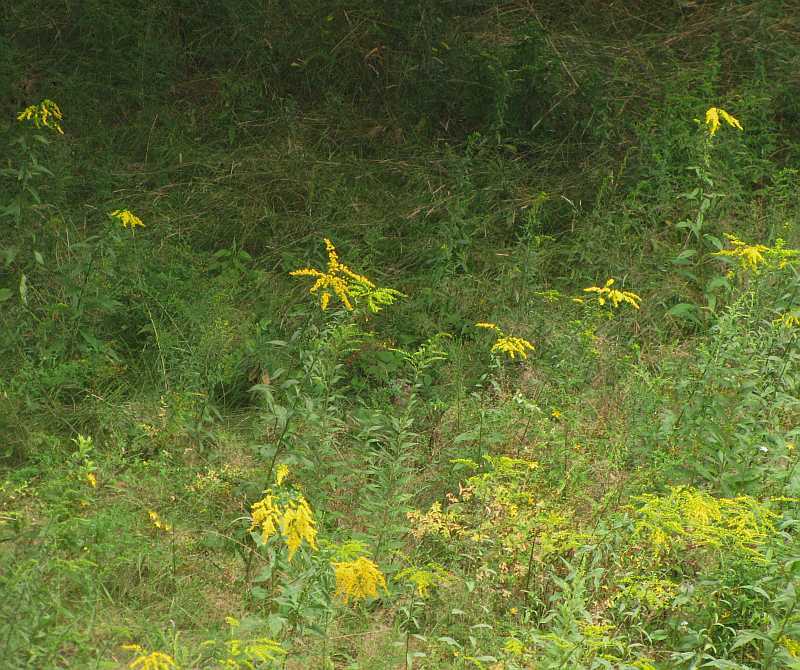 All three of these wildflowers are native to Columbia County. We did not spot any Monarch caterpillars along the farm creek. 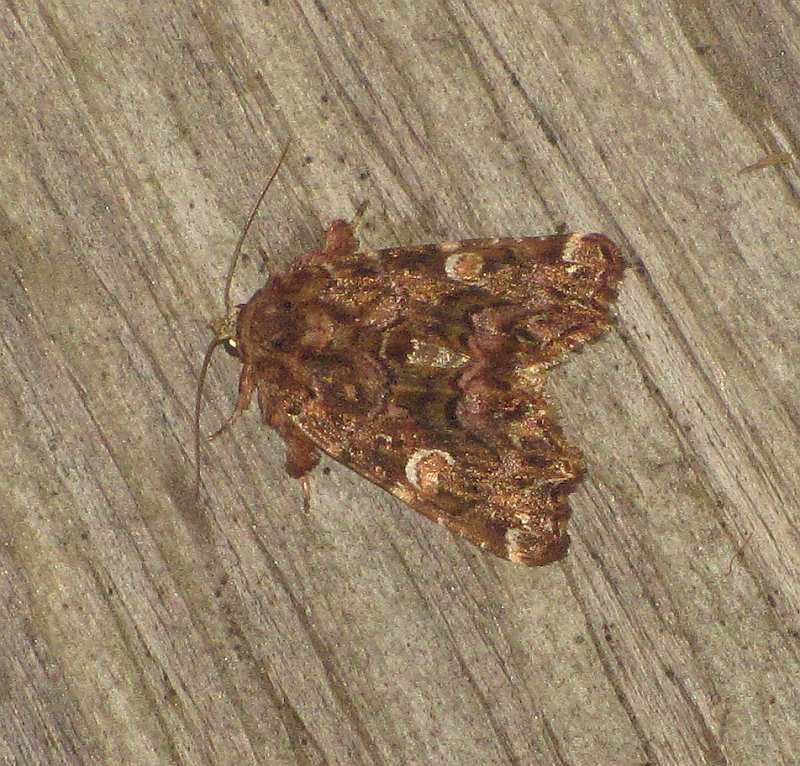 They are generally not very common this year. 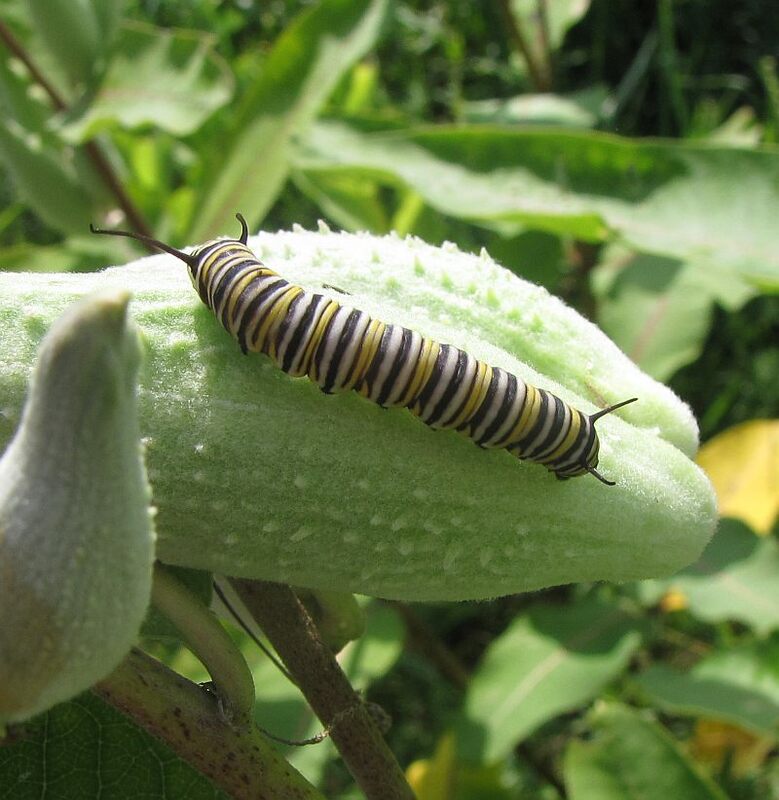 But we do have this one munching on one of our Swamp Milkweeds in the roadside garden in front of the Creekhouse. Less conspicuous, but pretty ubiquitous, is this Willow-herb. 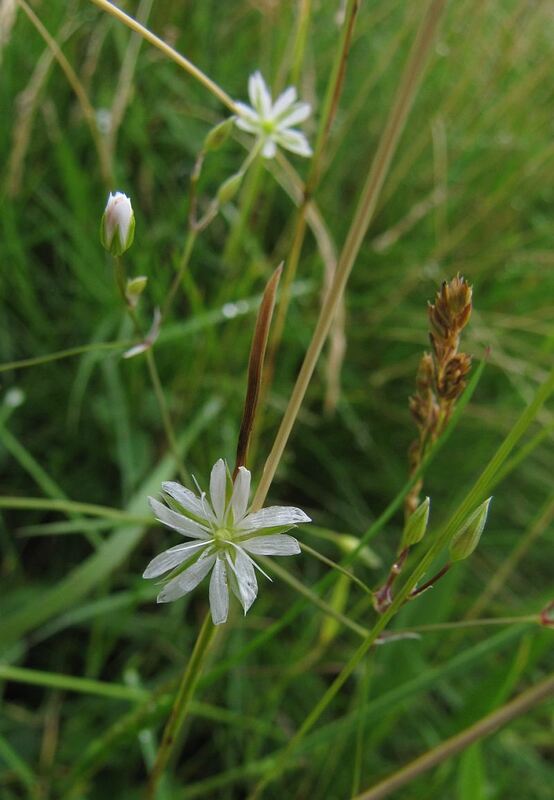 Its tiny pinkish-white flowers develop into plenty of feathery seeds which will fly off in great numbers in the fall. 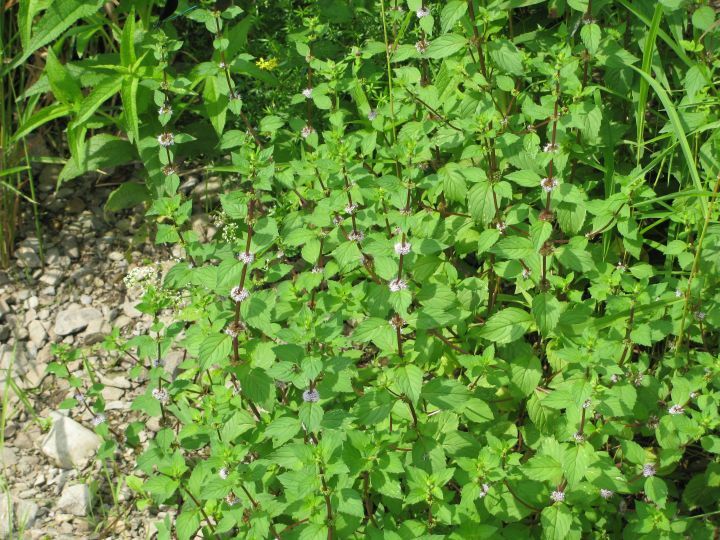 Another rather inconspicuous plant along the creek is Wild Mint, which we often first notice by the delicious smell it exudes when stepped upon. Monkeyflower, a native relative of the Snapdragons of our gardens, adds some blue to the flower landscape and likes to grow right next to the water. 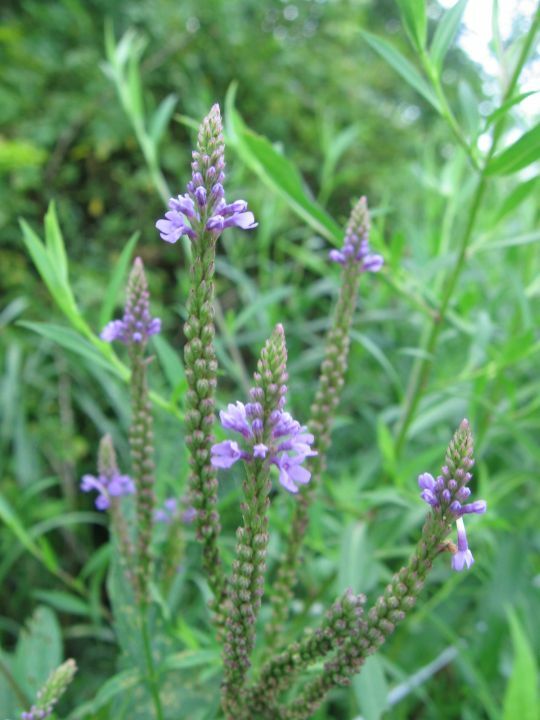 Blue Vervain is another native wetland plant that thrives in the farm creek corridor. 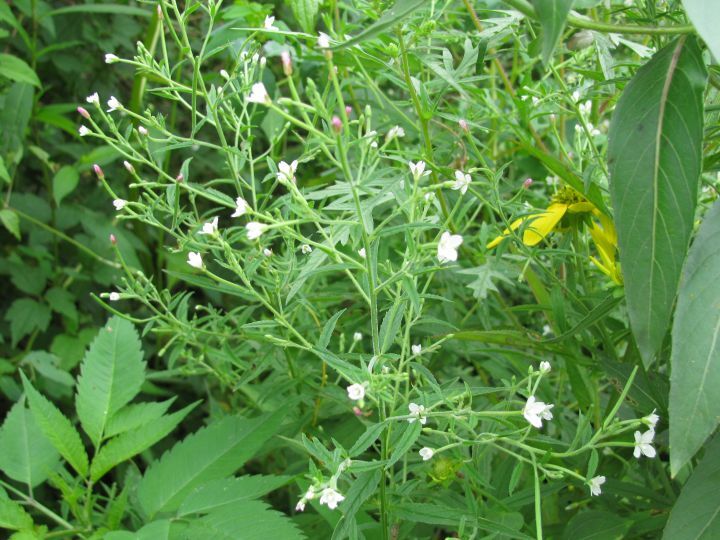 It is related to Lemon Verbena, and I often get asked if it is also a medicinal plant. 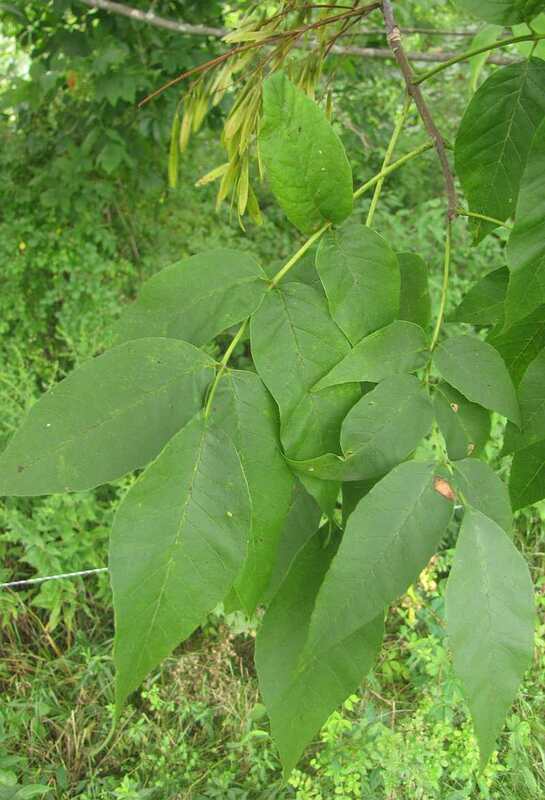 According to Peterson’s Medicinal Plant Field Guide, native Americans have used the leaf tea as a “female tonic”. 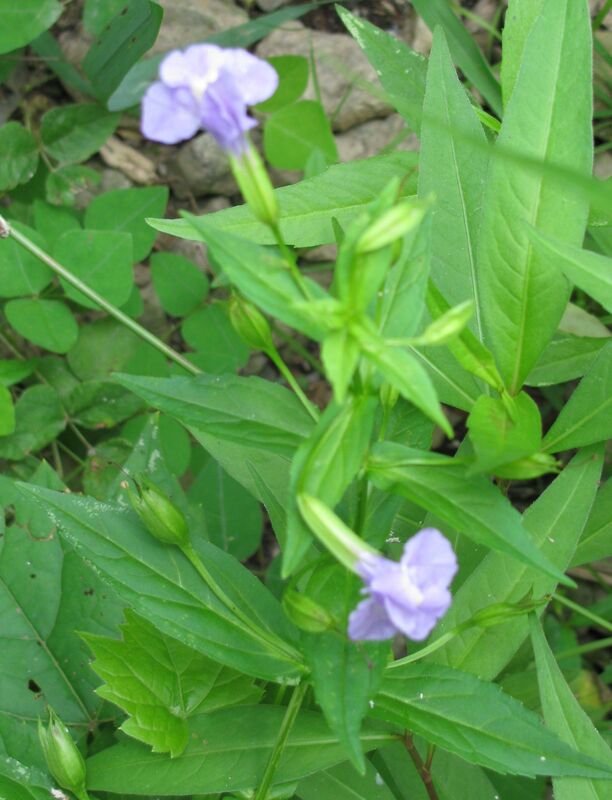 It was also used for colds, coughs, fevers, bowel complaints, dysentery, and stomach cramps. It large doses it is reported to be an emetic (induces vomiting). 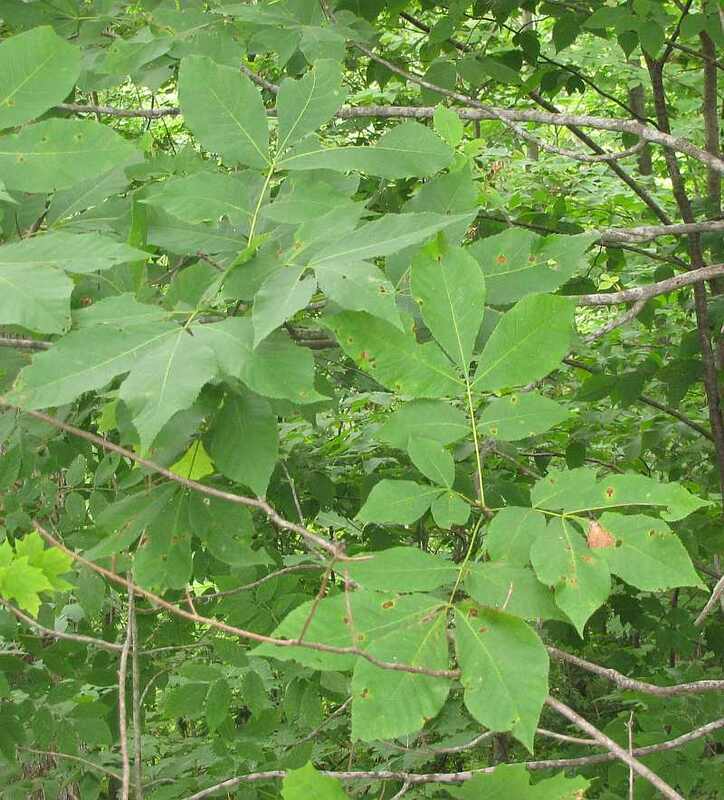 Modern herbal uses include headache and rheumatism relief and tranquilizer. 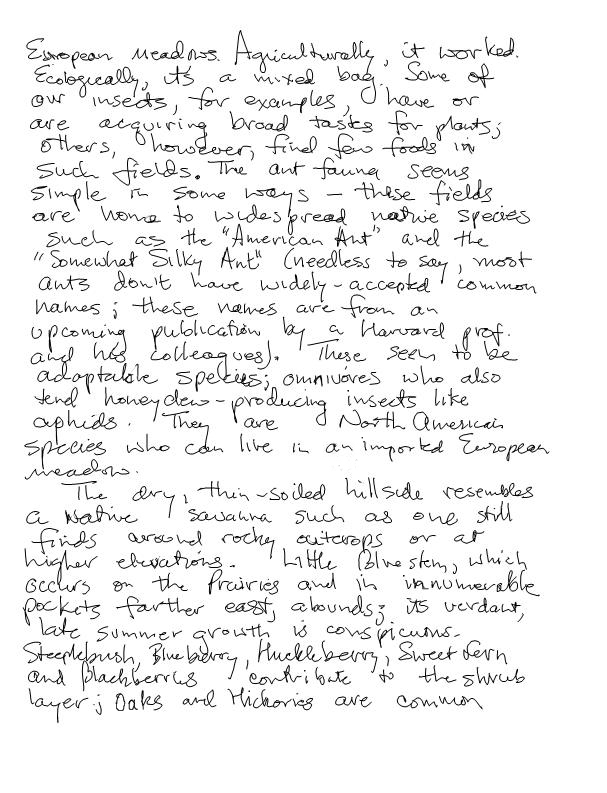 The Peterson Edible Wild Plants guide reports that its tiny seeds can be made into a somewhat bitter flour. Blue Vervain has a cousin, the White Vervain, which tends to be more of an upland species, but is common along the higher shore of the farm creek. It’s tiny white flowers (which individually look basically the same as those of the Blue Vervain, just paler) are arranged much more loosely along the spreading inflorescence spikes. 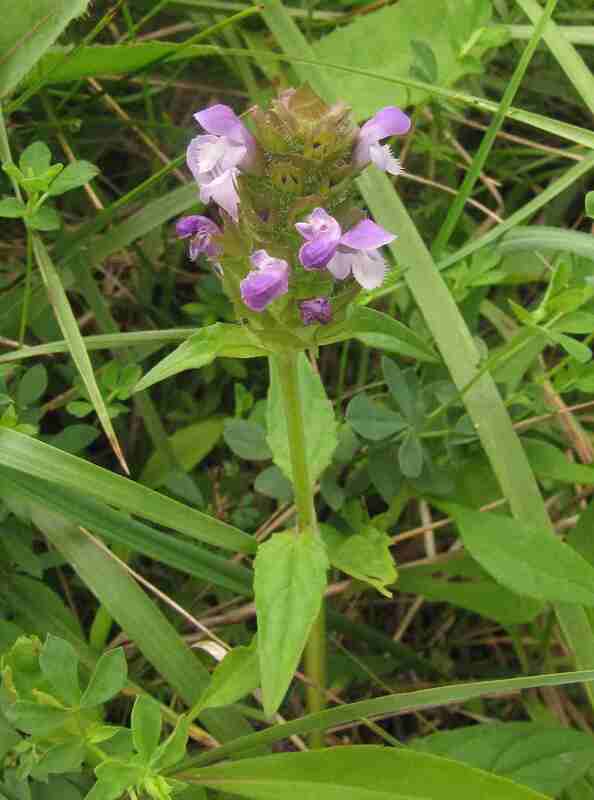 The picture above shows the sprawling White Vervain. 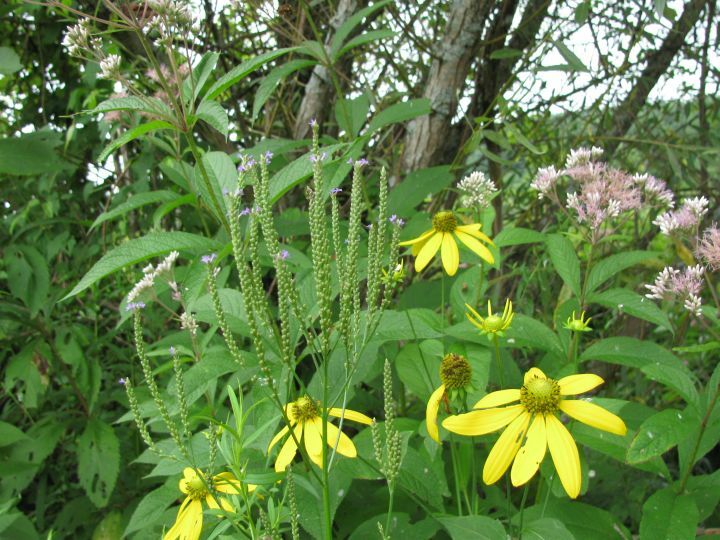 In the foreground, an example of a Hybrid Vervain (tiny, lavender-colored flowers on long spikes), surrounded by Green-headed Coneflower (yellow flowers) and Joe-Pye-Weed (whitish to pink). 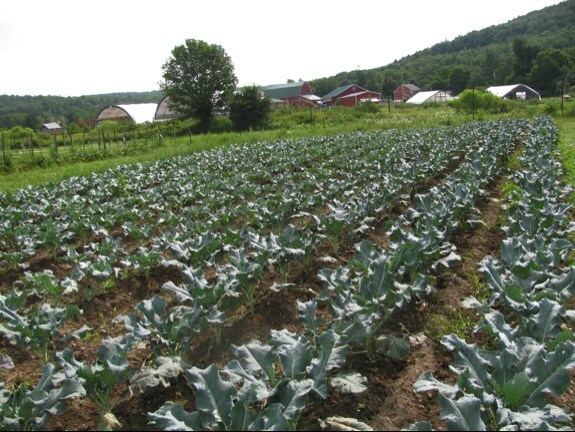 Just as in the natural areas we explore in Columbia County, the farm itself constantly changes with new and exciting happenings every week as different crops are planted, harvested, and turned under; the insects pollinating them arrive, mate and lay eggs; and new weeds sprout, flower and go to seed. 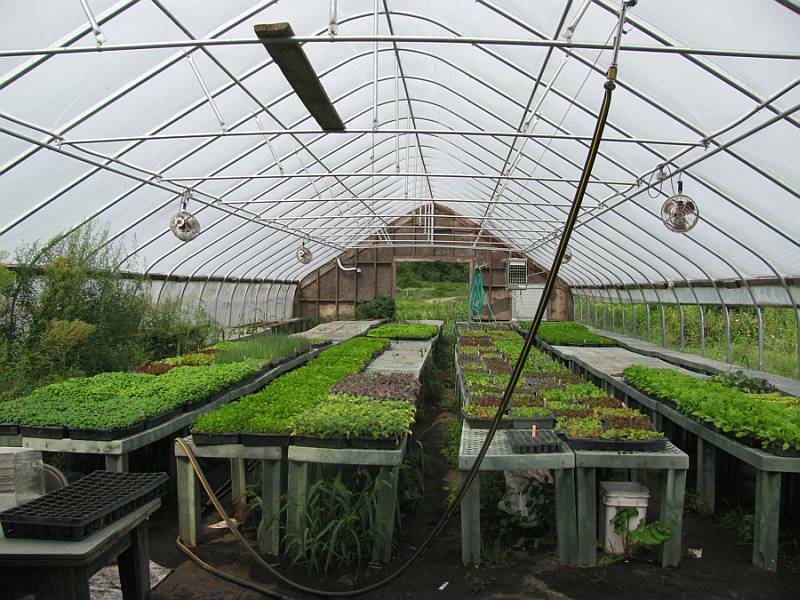 When living and working on the farm, these natural cycles and the changing of seasons become integrated into the forefront of our consciousness and planning, not just the backdrop to a daily routine. 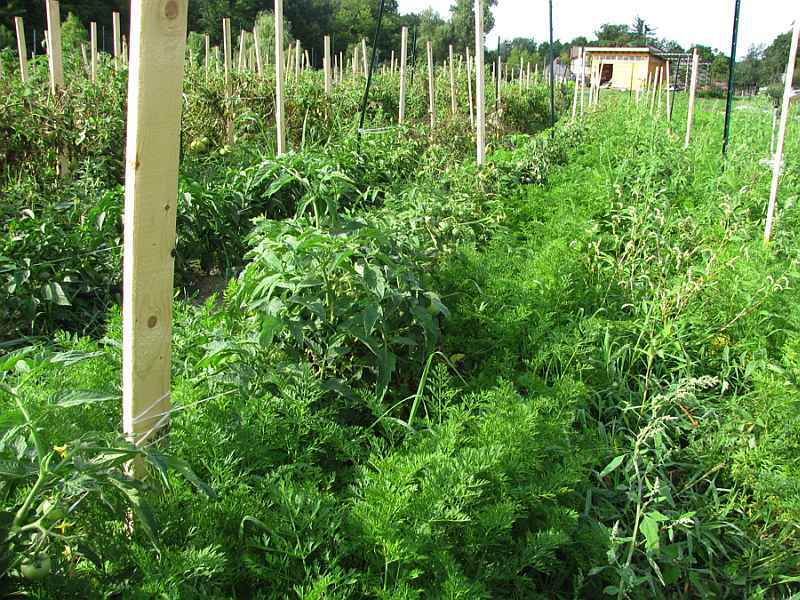 Right now we’re in full-on summer mode with tomatoes, peppers, eggplant, basil, green beans, cucumbers, and zucchini all coming in along with lettuce, chard, beets, carrots, kale, fennel, cauliflower, and more. 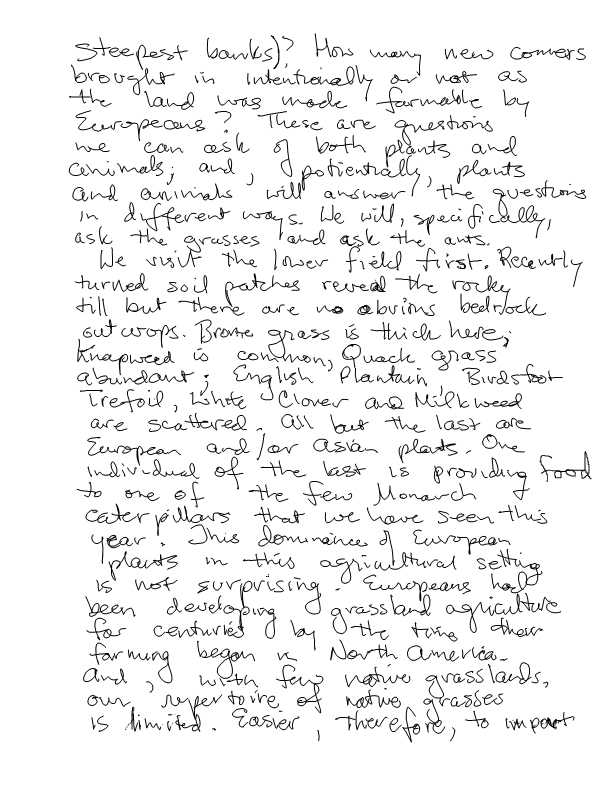 Between the cultivated and non-cultivated plants, insects, birds and other animals on the farm, the fields are diverse, dynamic places to explore. 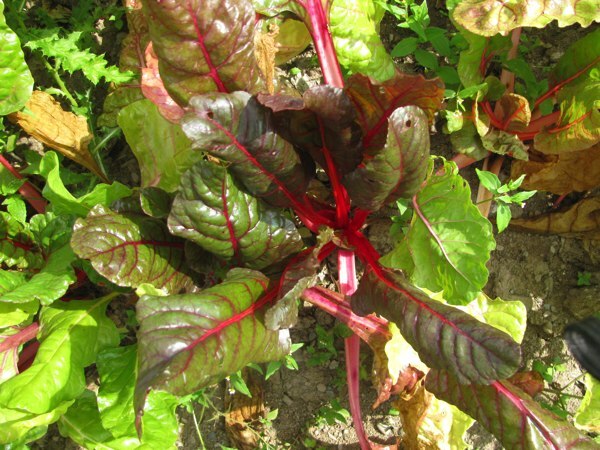 Here are some pictures of what’s growing on the farm (both what was planted and not) and some of the animals who have made their homes in the vegetable gardens. It’s especially interesting to compare some of the cultivated varieties to their related, non-domesticated weedy competitors. 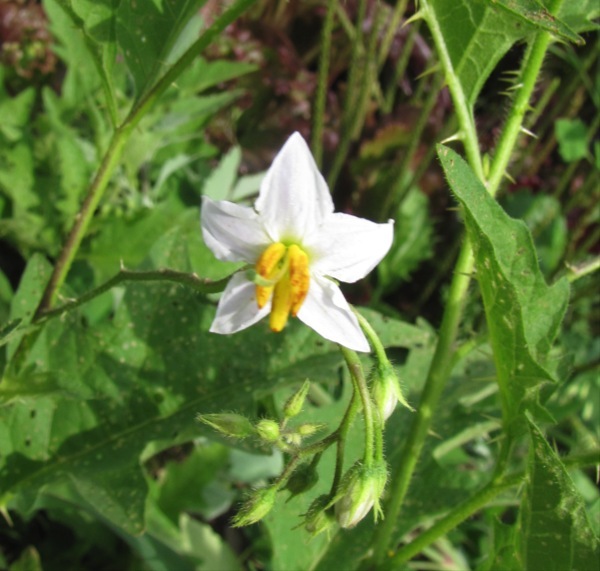 For example, horse nettle (Solanum carolinense var. 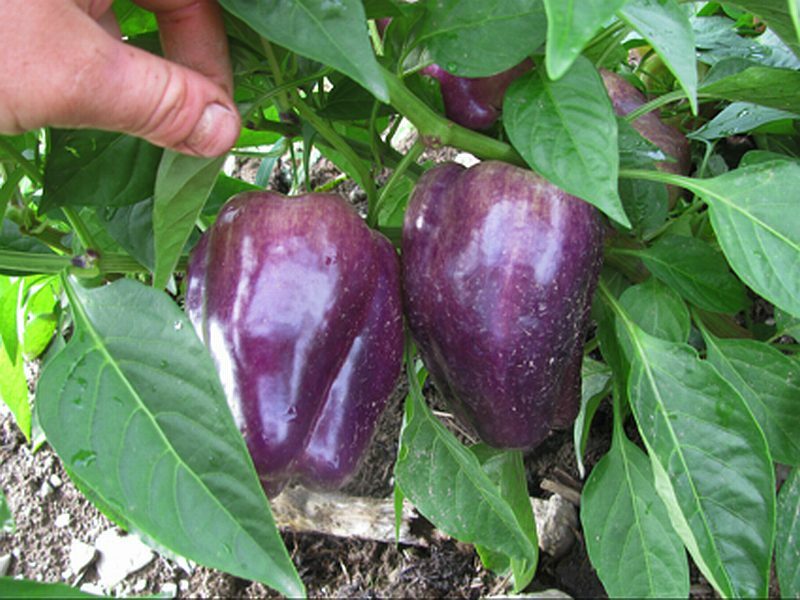 carolinense), a member of the nightshade family of plants, is quite prolific in parts of the Corner Garden. However it does seem to be popular with both bees (can you see the bumblebee in the picture?) 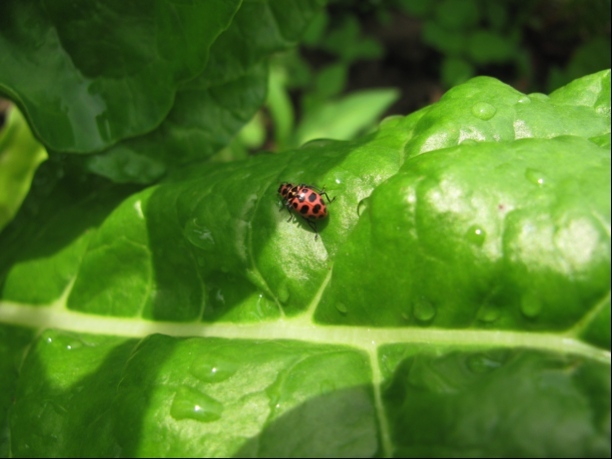 and flea beetles, so it is useful to have around for attracting pollinators and keeping flea beetles from eating holes in the eggplant and brassica leaves. 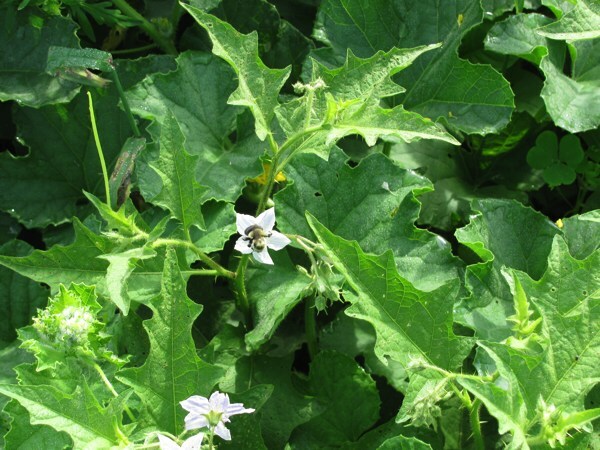 Thank goodness none of the delicious cultivated nightshades like tomatoes, peppers, and eggplant have the vicious spines of horse nettle! 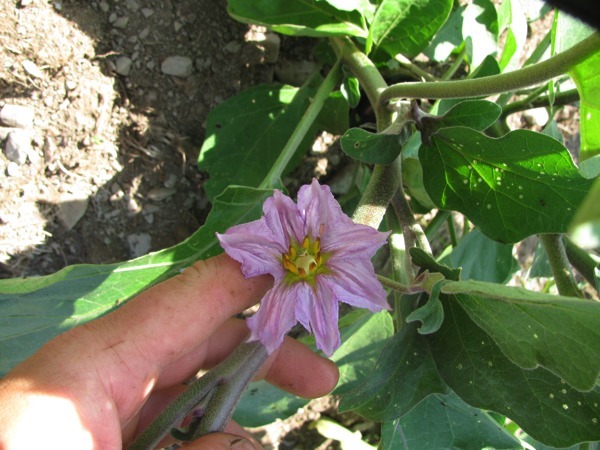 and a tomato flower (& 'fruit')…. 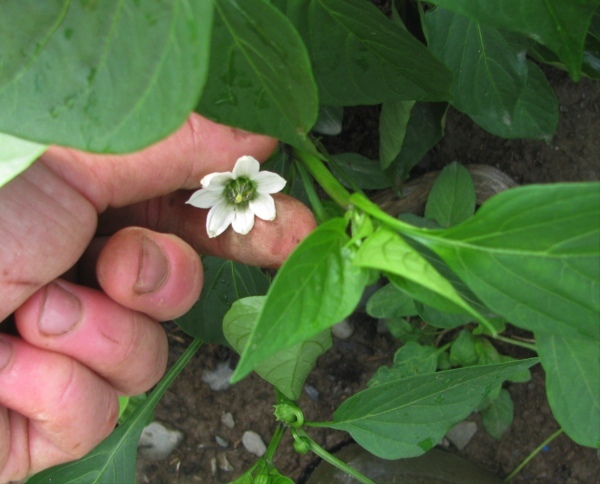 …and a pepper flower (& 'fruit'). 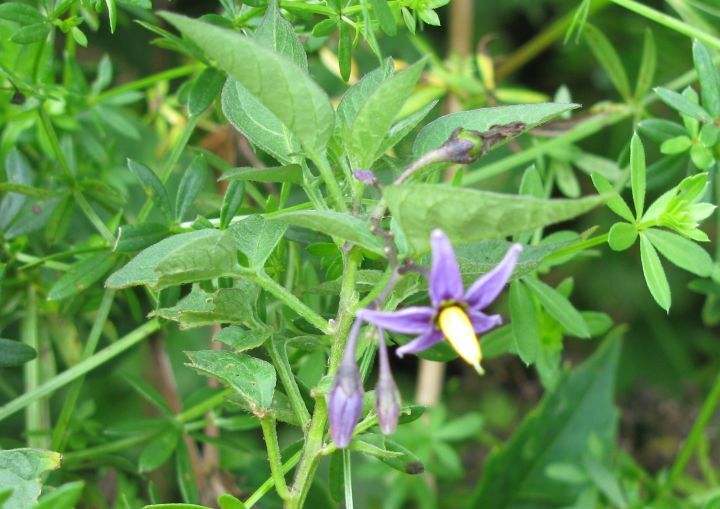 Similarly, bittersweet or climbing nightshade (Solanum dulcamara var. 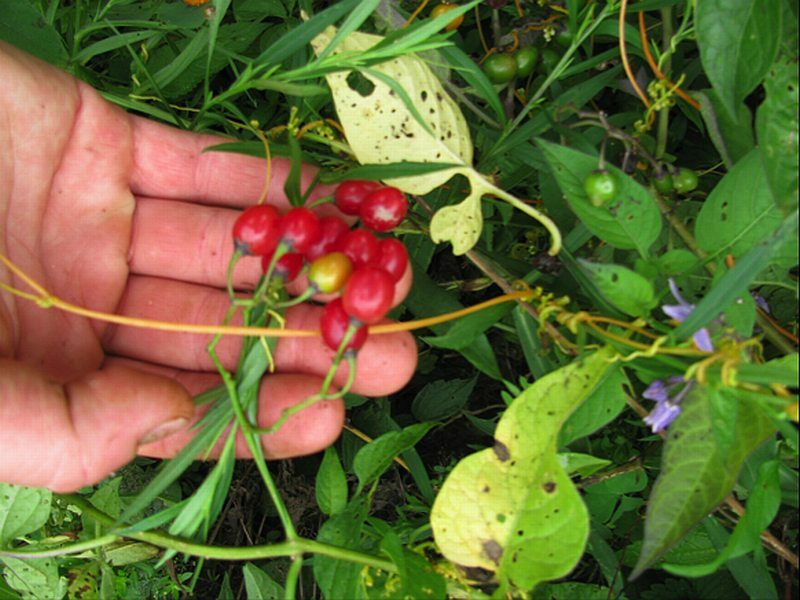 dulcamara) grows along the farm creek, and you can see from the poisonous fruits why Europeans were originally wary of tomatoes and other nightshades brought over from the New World. They say that carrots love tomatoes, so the Corner Garden is experimenting with companion planting of the two. 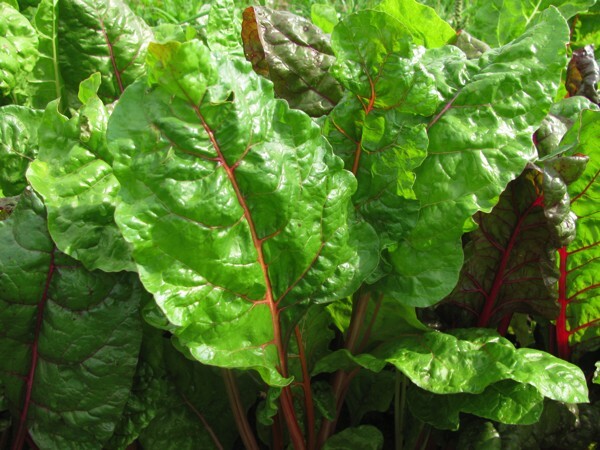 its relative in the Amaranthaceae family, Swiss chard, is one of the most popular greens on the farm. 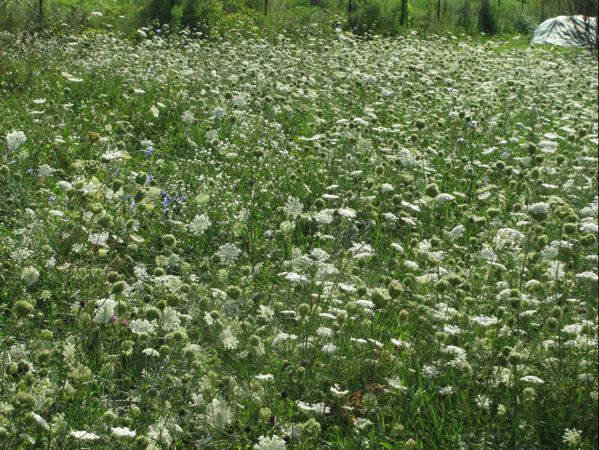 Queen Anne’s Lace or Wild Carrot (Daucus carota), Fennel, and Carrots of the Apiaceae family all grow in the gardens as well. 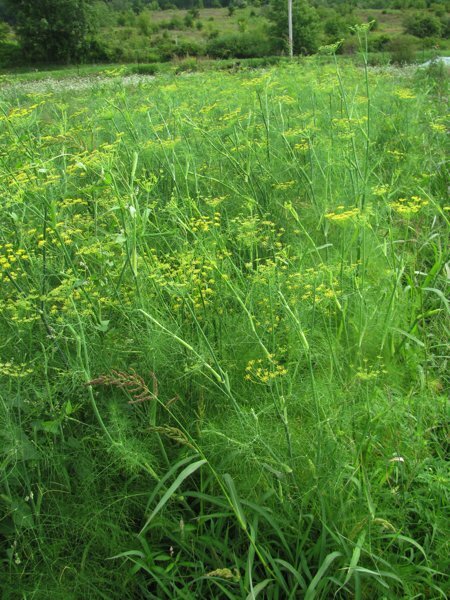 This is the Corner Garden fennel. You can see the similar umbellate inflorescence of these wild carrots on the edge of the field. 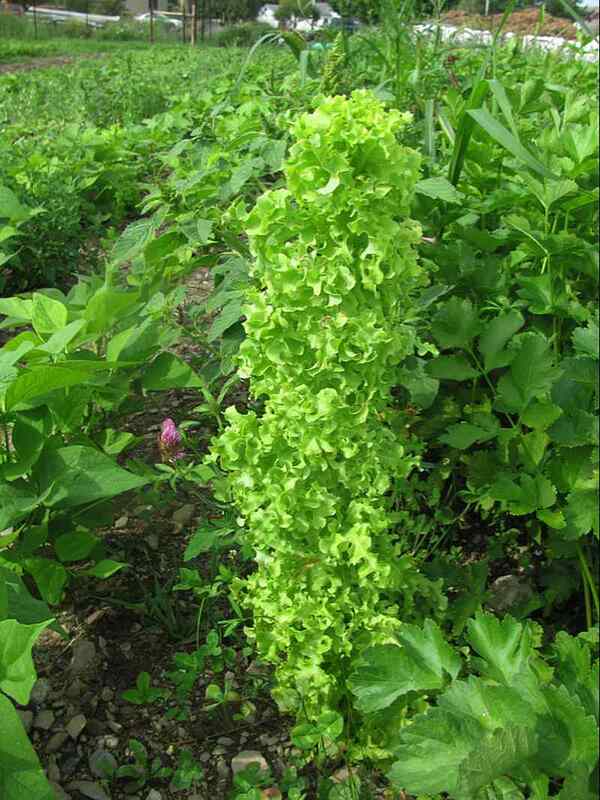 And this is an impressive head of green oakleaf lettuce that bolted, or started to prepare to flower and go to seed. The plywood greenhouse with the next successions of basil, lettuce, kale, and more. Here are the beds of Siberian Kale in the Main Field. 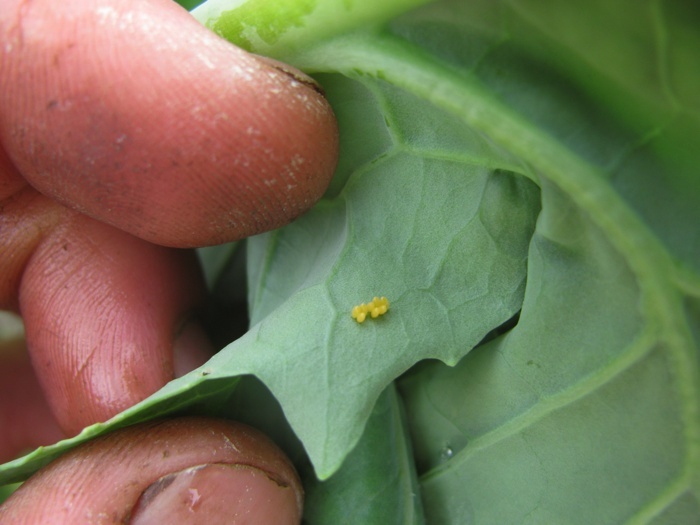 Then zooming in, here are the eggs of a cabbage butterfly on the underside of a kale leaf. 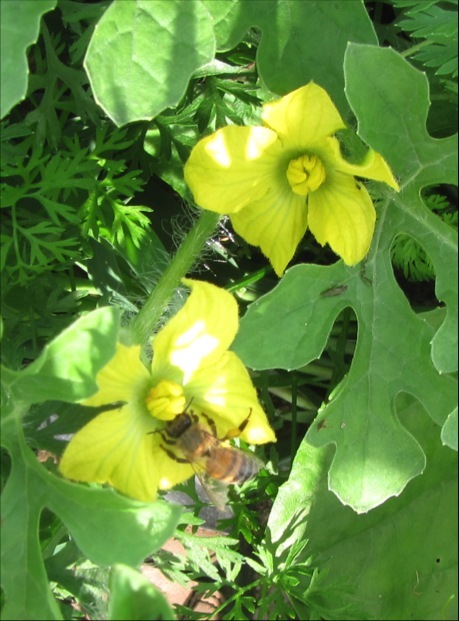 In this winter squash flower you can see a striped cucumber beetle, a spotted cucumber beetle, and likely a Peponapis bee. 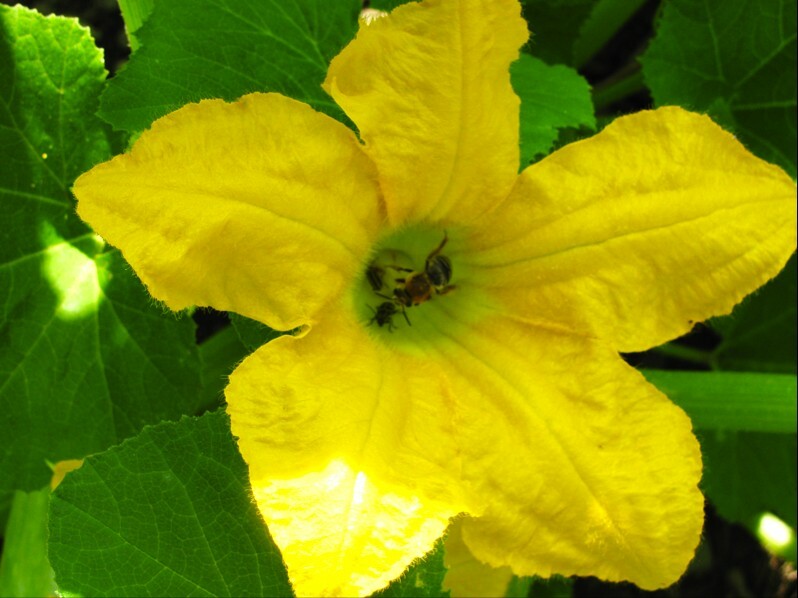 The bees in the Peponapis genus are North American natives that specialize on the Cucurbitaceae family (squash, melons, gourds etc.). They originated near Mexico with their squash hosts, and have followed the movement of squash plants north with indigenous and later European cultivation. 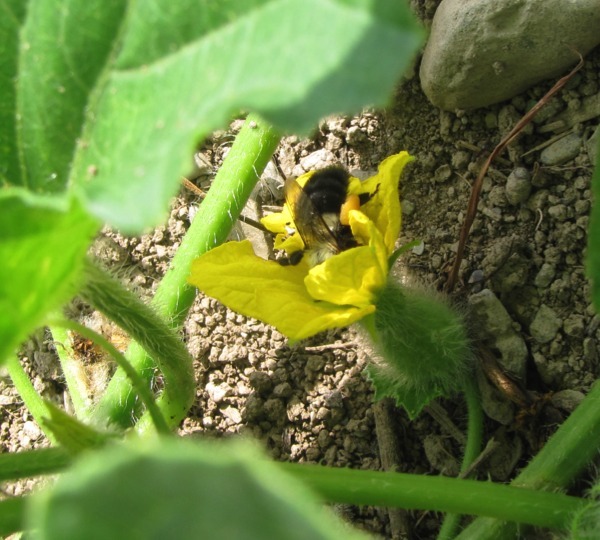 They are by far the most important pollinator for squash plants, but you’ll also find other bees and pollinators getting in on the action too. Unlike the honey bee and other social bees, Peponapis are solitary bees and dig holes (easily a foot deep) in the ground to lay eggs and raise young. 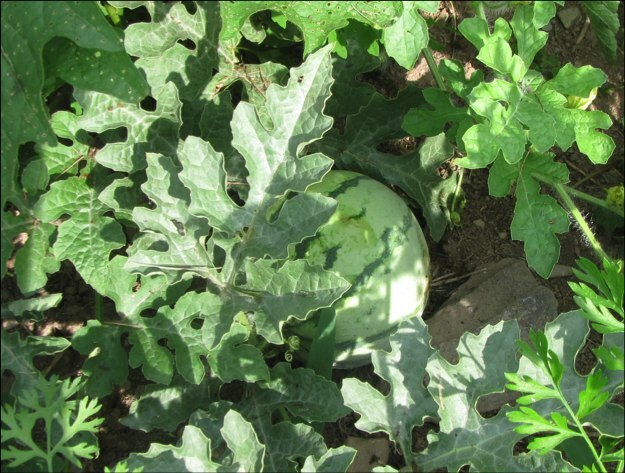 small watermelons in the Corner Garden. and helping out the Peponapis (though they probably don’t need it) on Cucurbitaceae (melons, squashes, cucumbers and the like). 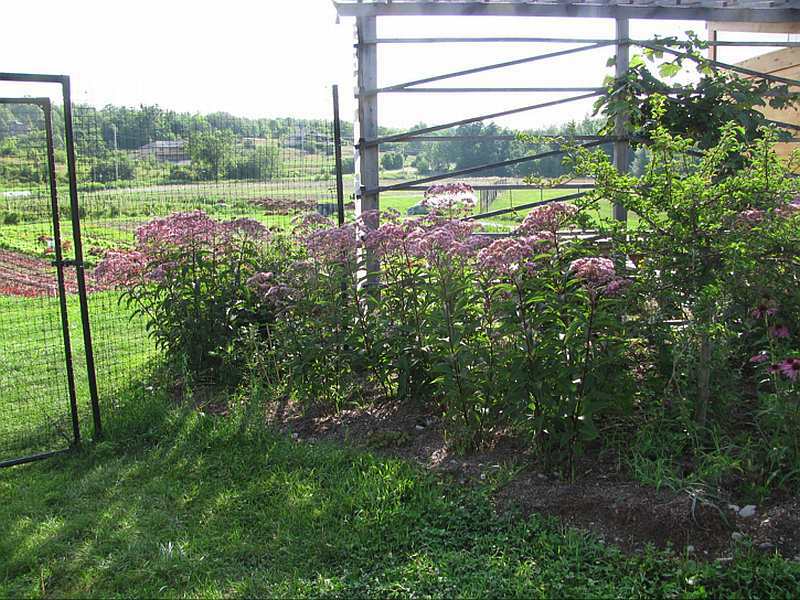 Joe Pye Weed planted in the Corner Garden. 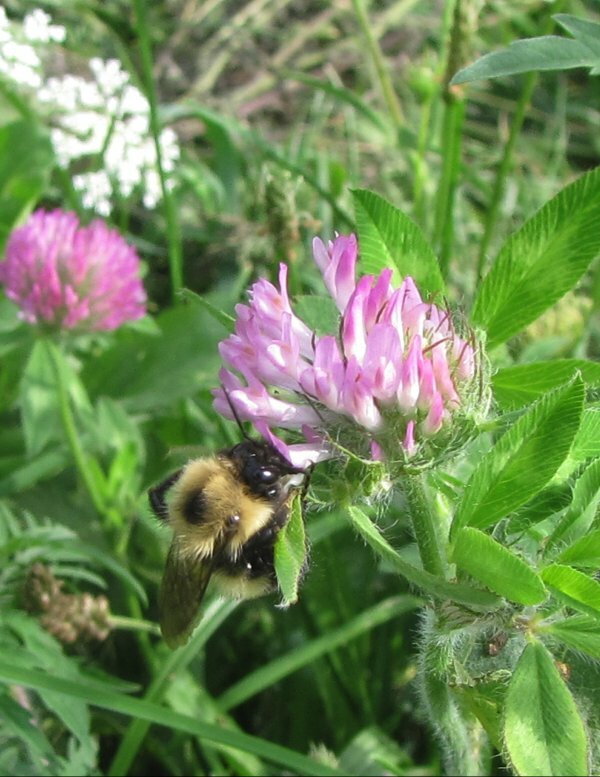 It grows along streambeds and in wet areas throughout Columbia County and is also quite popular with the bees. but this one, which you might be more used to seeing, originally came from Asia. 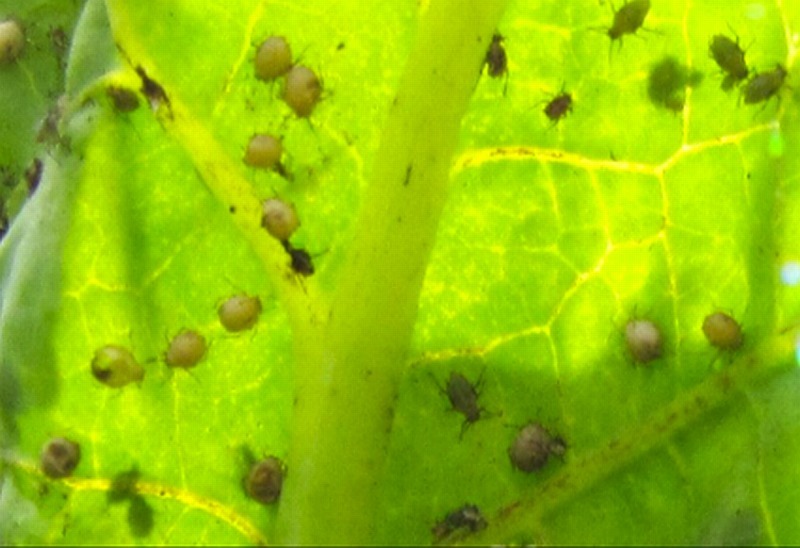 Both can feast on these aphids though, shown on a chard leaf. 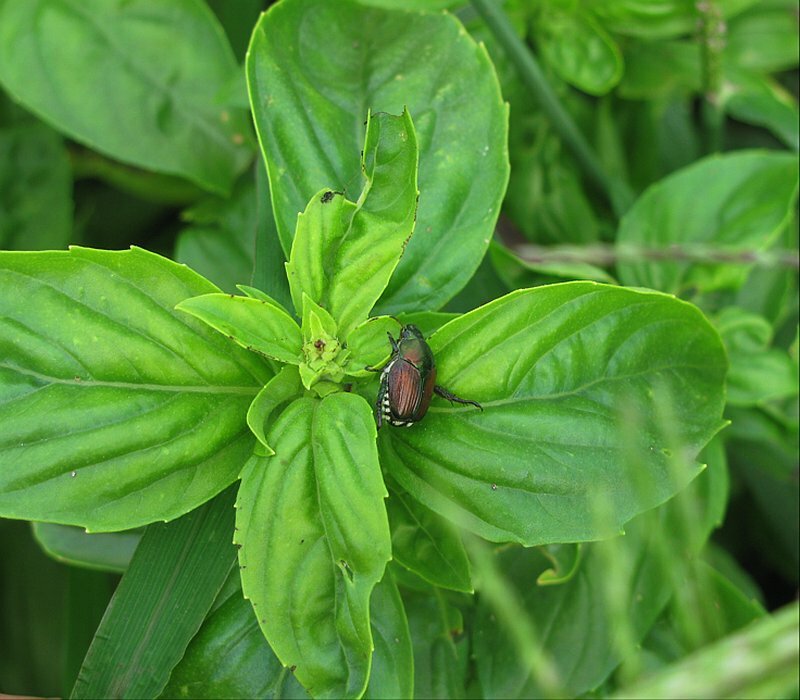 The Japanese beetles have done a bit of damage to basil, but thankfully not too much else. They can devour entire leaves except the veins and completely destroy plants. 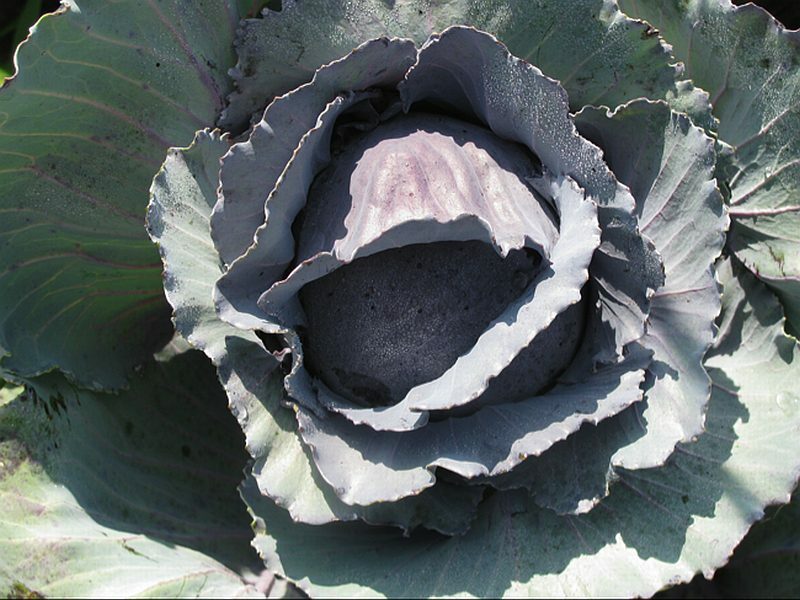 Here is a head of red cabbage that can be harvested soon. The Meadow Fritillary is a native butterfly that not surprisingly prefers meadows and other open areas for the abundance of their host plants, violets. The initial colonial clearing of land was a boon to the Meadow Fritillary, but once tilling and crop cultivation became more common, the important violets were not as available. The Meadow Fritillary is now gone from eastern Massachusetts, though it remains in the western part of the state. 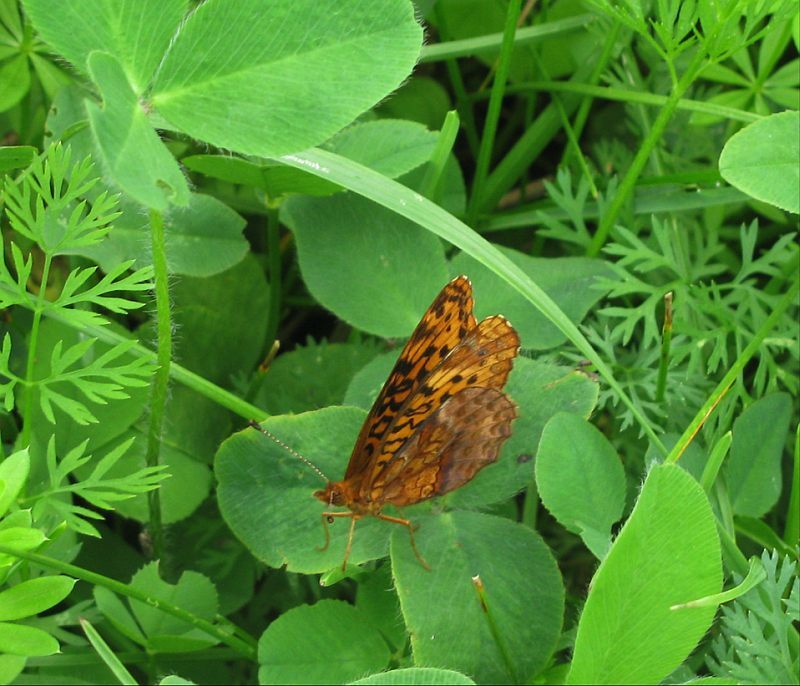 Although this butterfly was found in the vegetable gardens, most of the open land surrounding the vegetable fields is either cut for hay, or used for cow pasture, practices which might maintain the low-growing violet population for the Meadow Fritillary. Birds on the farm are a great assets especially when they eat pests. 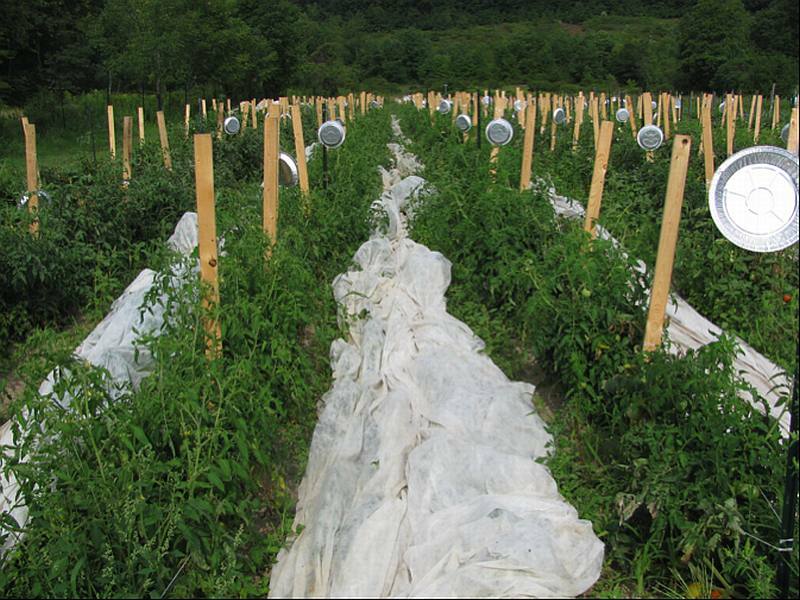 When they (mostly crows) start going for the tomatoes though, it’s less ideal. These pie tins on the stakes in Main Field reflect light and make noise in the wind to scare the birds away. These two killdeer are probably protecting one of their small, unassuming nests laid on open ground, often right in the fields. If you get too close, the male will shriek and the female will pretend to have a broken wing to sacrifice herself for their young. These are some of the grassland breeding birds that can use farm fields as analogies to their original coastal, wet meadow or prairie-like habitats. 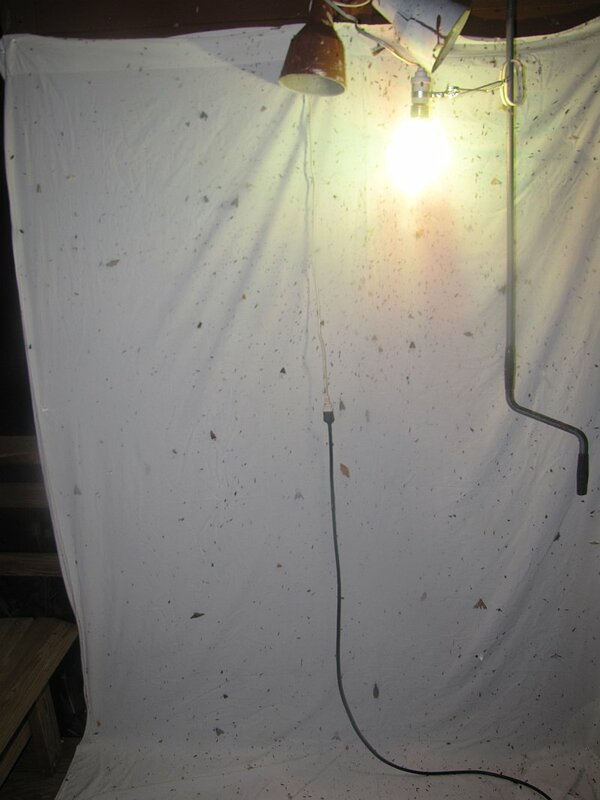 It may look as if we're trying to dry our laundry with a sun lamp, but actually this is our set-up for moth surveying. Of course, we do it at night, but then it's harder to visualize the arrangement. 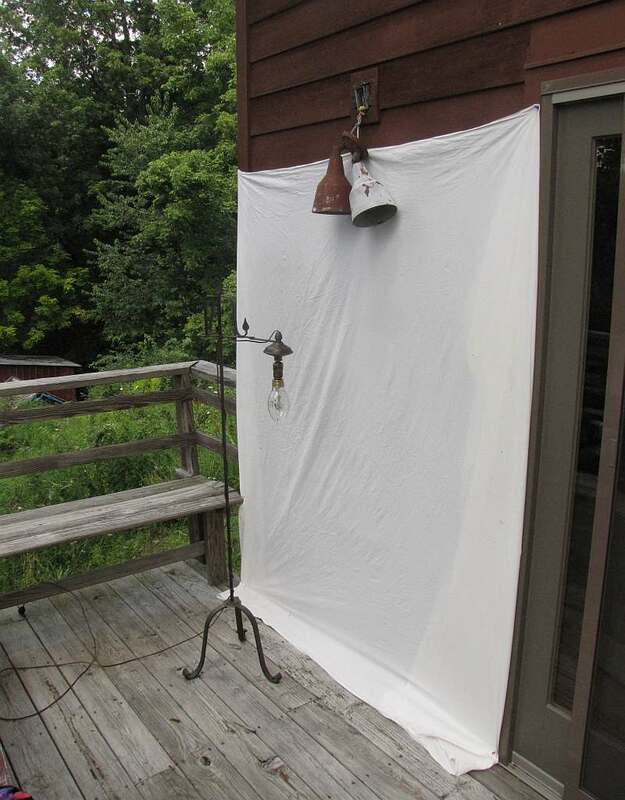 With the light on (and located in a slightly different spot), the setup looks like this in action. to the East, we have pasture, hedgerow and, not quite in view here, vegetable gardens. 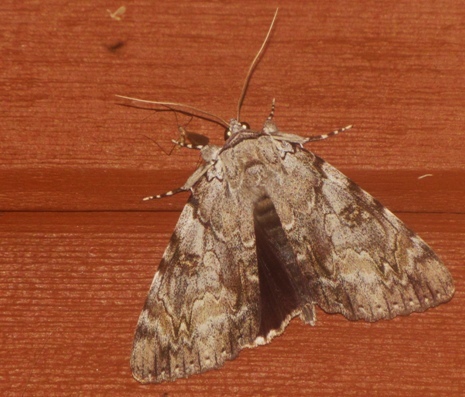 For this blog, I took the list of moths which had so far arrived at our sheet, noted down their reported foods, and then headed out into the surroundings to look for nearby exemplars of those food plants. 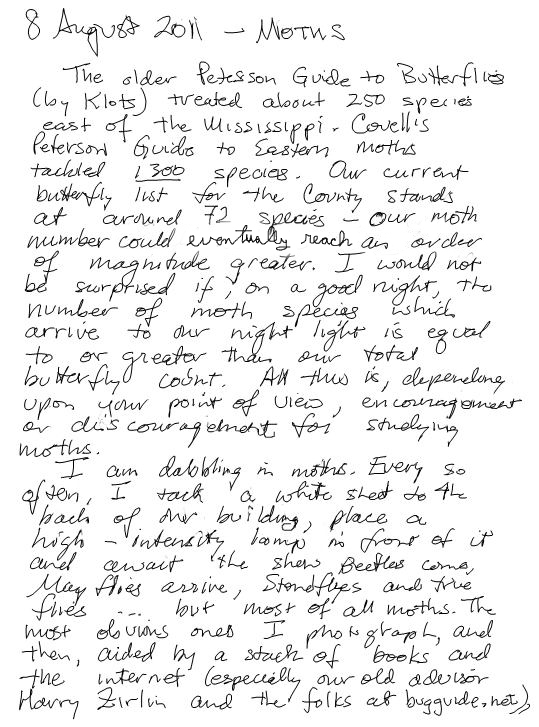 What struck me when first tallying the foods of the moths on our list was how many have caterpillars which are "polyphagous", a complicated word meaning that they aren't too picky in their diets (literally, "many eating"). More than 50% of the species on our list fell into that category. 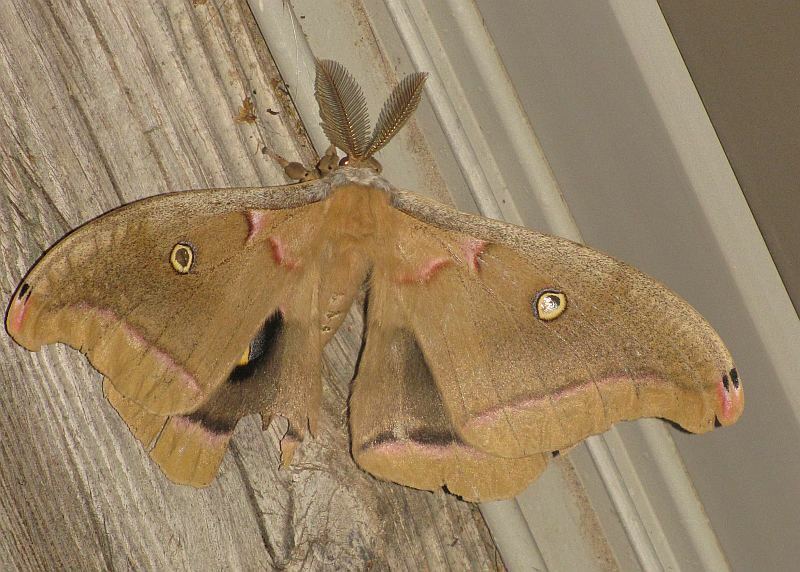 Dietary generalists include some of our most conspicuous moths such as the Polyphemus Moth, which feeds on a variety of woody plants. 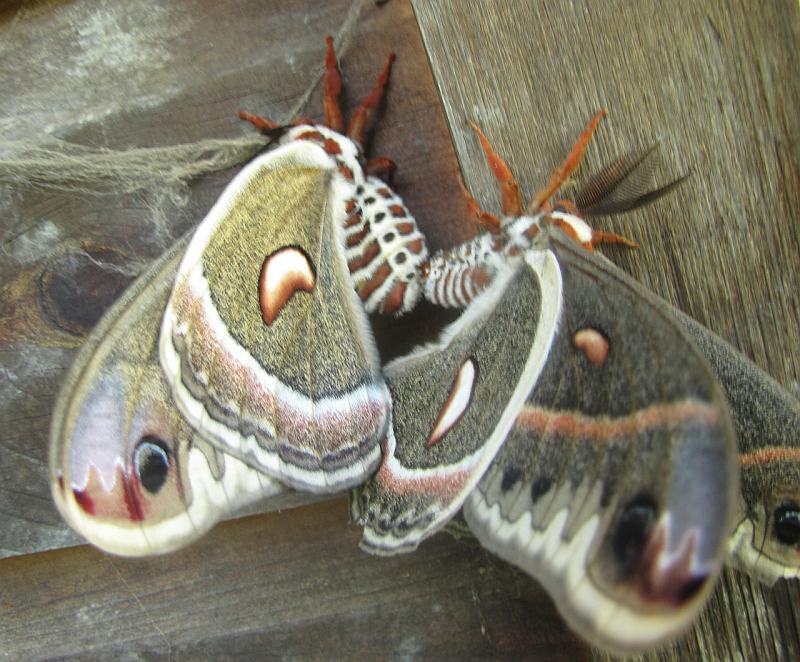 Or the Cecropia Moth, whose larvae eat a range of woody and herbaceous plants (this pair was mating down behind the School; thanks to the Farm & Arts Program for letting us know and to our son Otter for taking the picture). 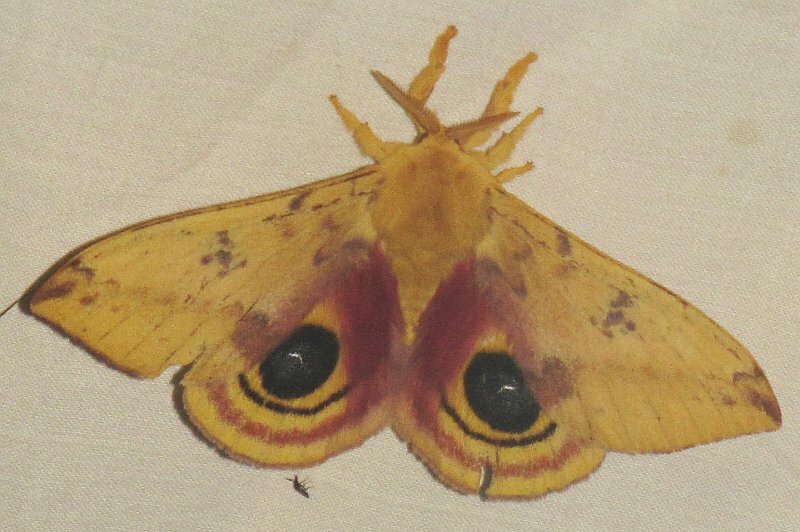 Or the owl-eyed Io Moth, whose caterpillars also dine on an assortment of woody and non-woody plants. Our showy Luna Moth - of whom I have no good pictures, but who has been relatively common this year - also sups on many different trees and shrubs. 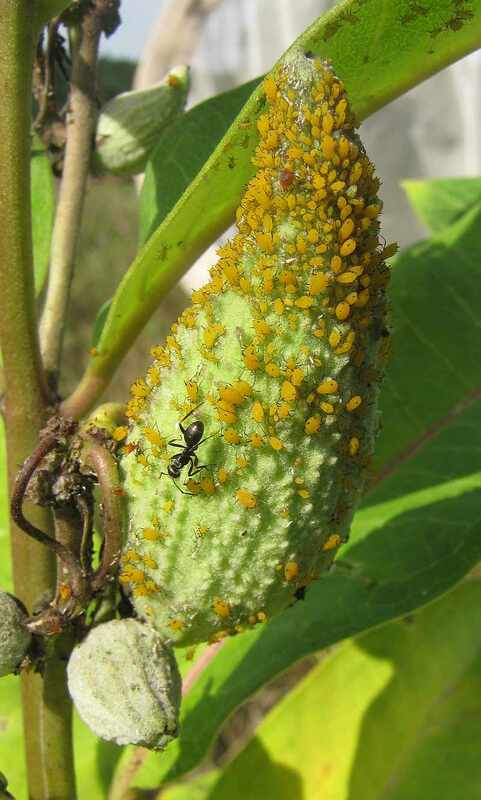 One aspect that is unclear is at what population level polyphagy occurs - could a given, individual caterpillar choose to feed upon whatever plant was handiest, perhaps even switching foods during its life cycle? 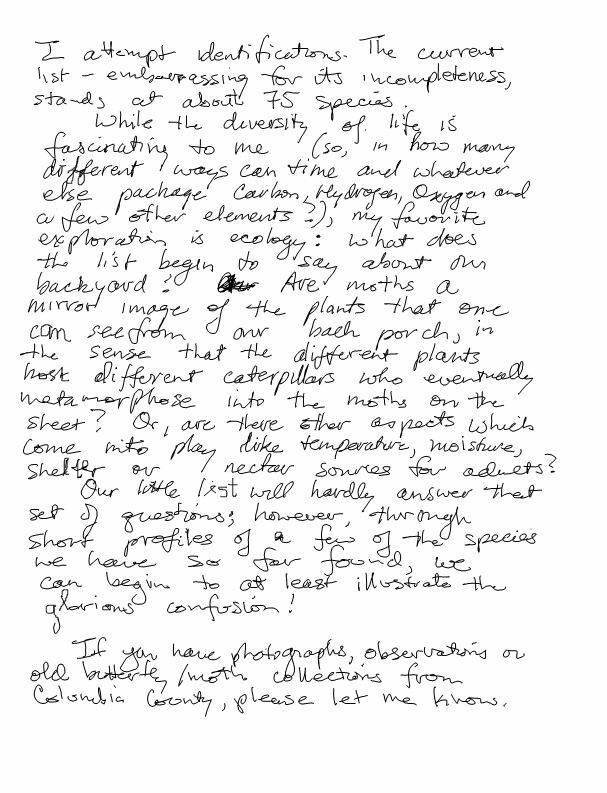 Or, are the diets of given caterpillars or even of given populations confined to a more limited set of plants? 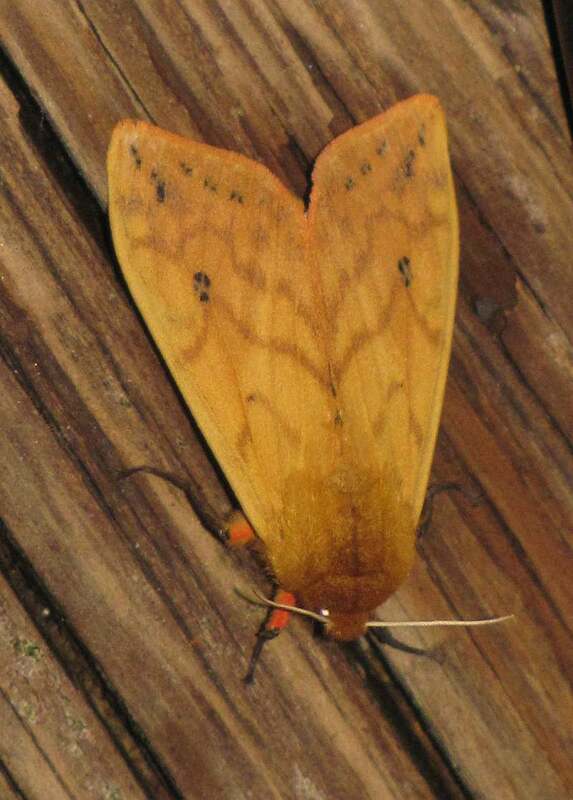 Given the abundance of its caterpillars, it is perhaps not surprising to learn that this dashing Isabella Moth, in scarlet leggings and black boots, is a generalist feeder on both woody and herbaceous plants. This moth is probably more familiar to us all in its caterpillar stage, when it is known as the Wooly Bear. Then come species which are a bit more particular and reportedly feed upon plant groups. 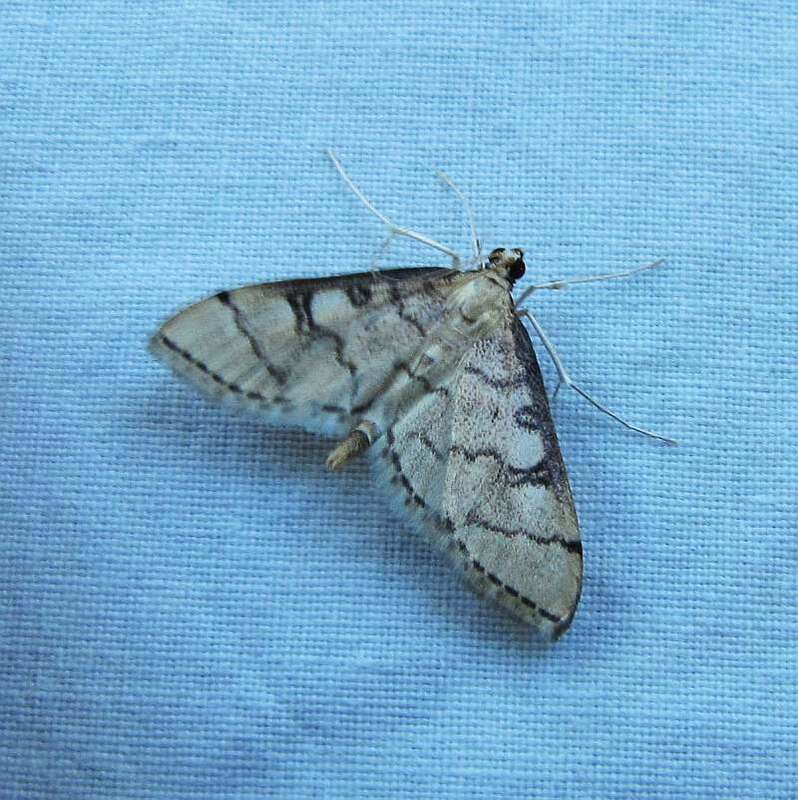 This is the Pink-shaded Fern Moth; it feeds upon ferns. This happens to be Sensitive Fern. 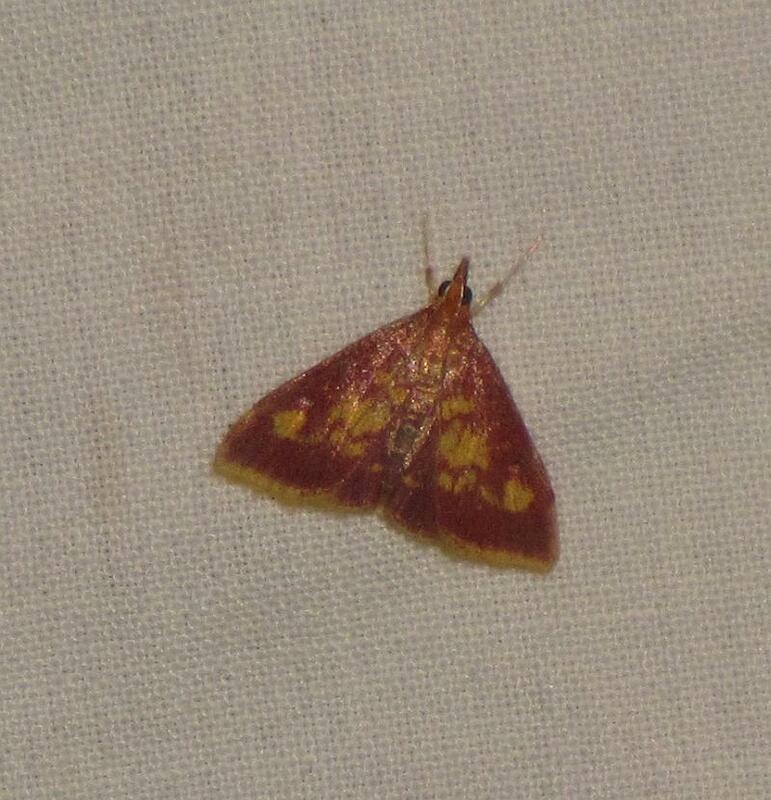 Do I know that the Pink-shaded Fern Moth feeds upon Sensitive Fern? No. Do I know it doesn't? No. 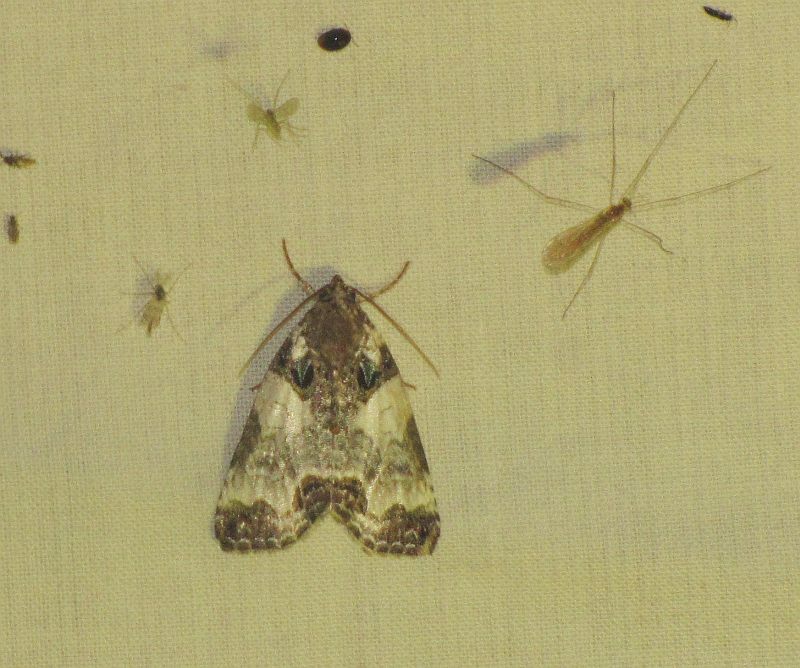 One quickly reaches the apparent bounds of knowledge when exploring moths. 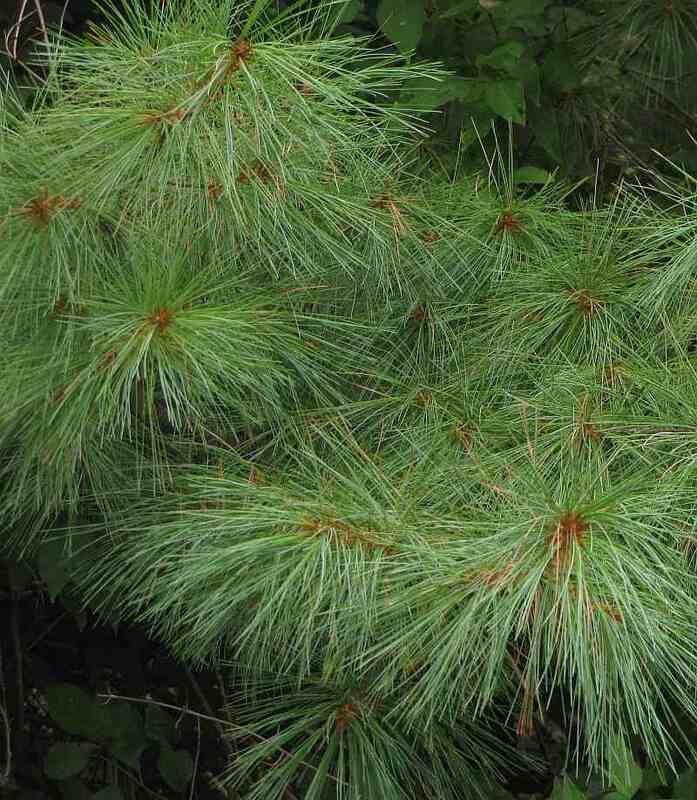 like this White Pine. There is some suggestion, however, that Hemlock may be a favored food. 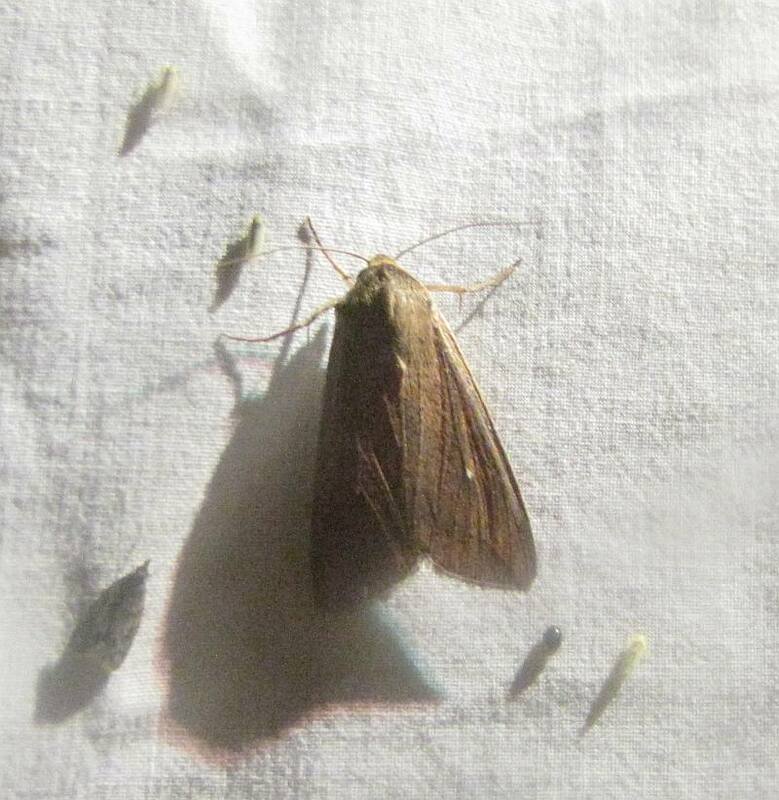 Then there are a set of moths which seem to confine their caterpillar diets to single plant families. 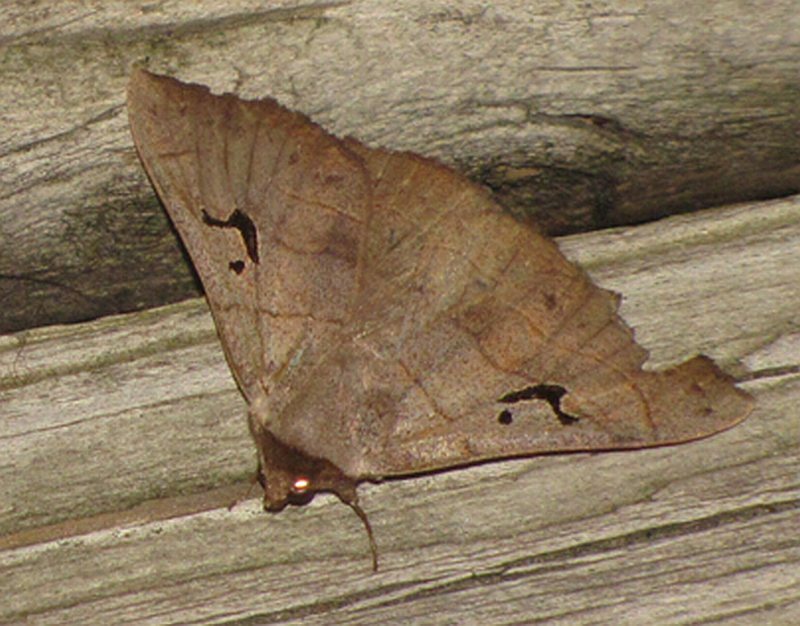 This Tufted Bird Dropping Moth feeds primarily on plants in the Rose family such as Cherries, Serviceberry and true Roses. members of the Grape Family (Vitaceae), including its namesake and grapes like these, located just opposite our night light. ashes, another member of the Olive family. Ashes are particulary common along the creek below the house. 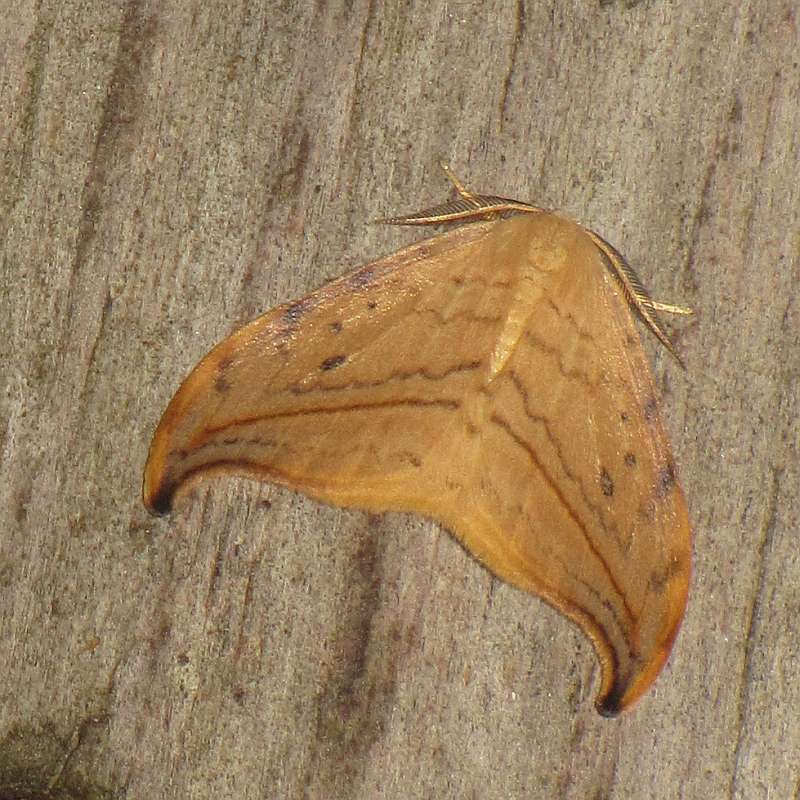 This elegantly inscribed species is the Brown Panopoda. 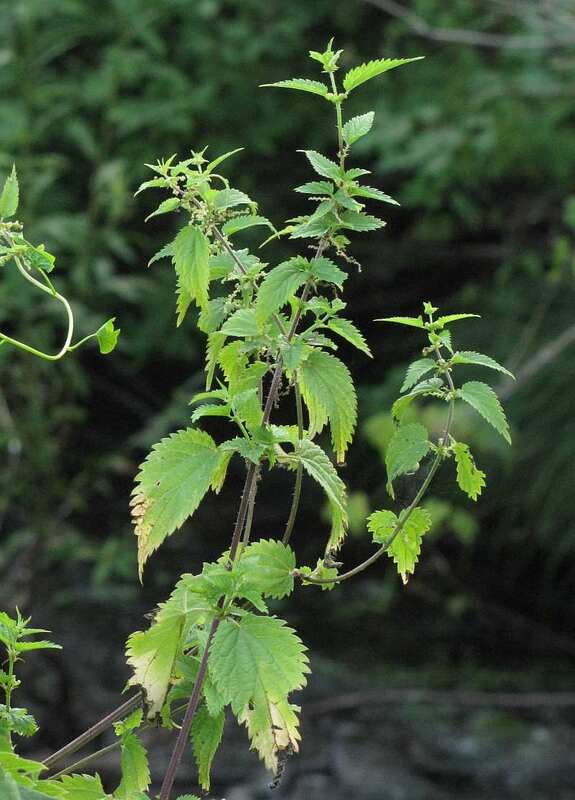 Nettles, a group of plants know to be both appetizing (when properly prepared) and somewhat 'uncourteous'. The Green leuconycta should have no problem finding food around our fields. 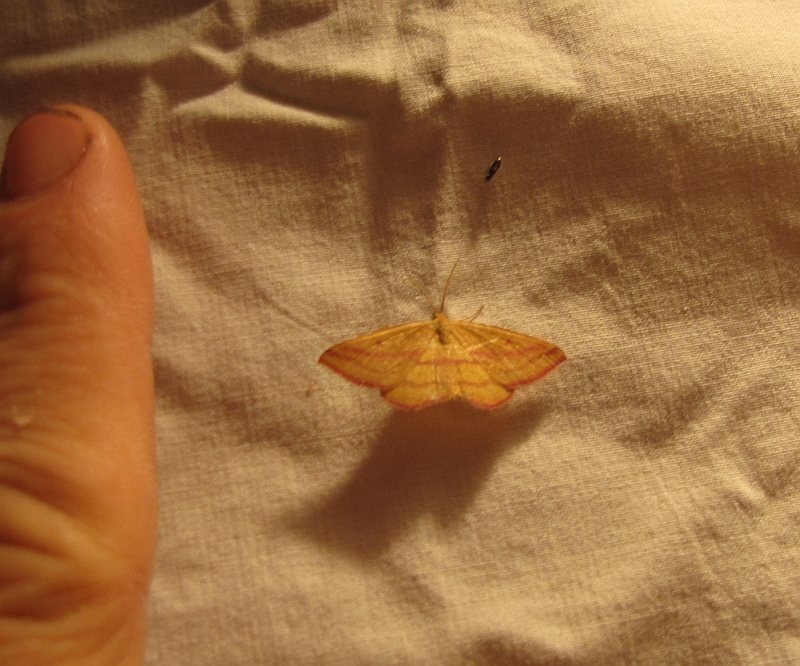 Arched Hooktip may haunt our wetter corridors where Alders are common. 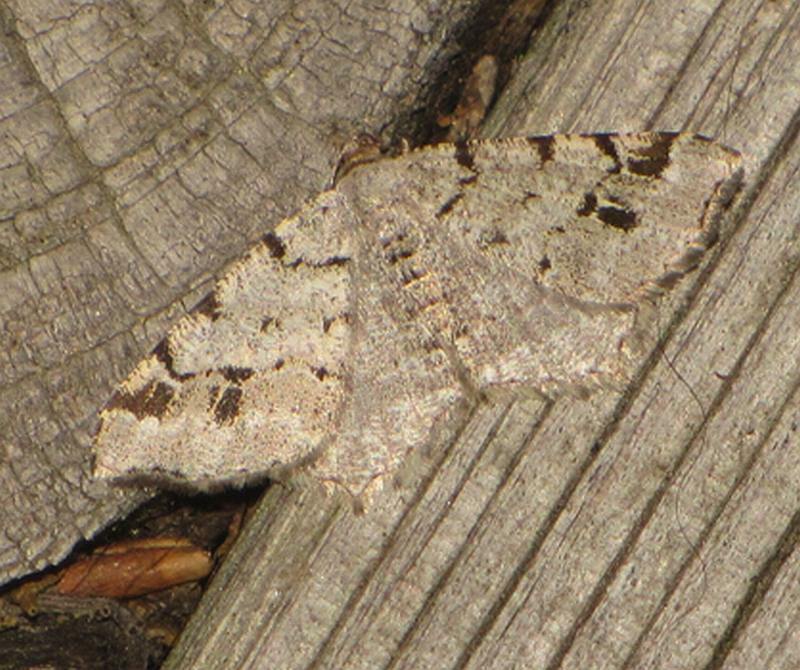 I've spoken little about camoflauge or other defensive coloration. 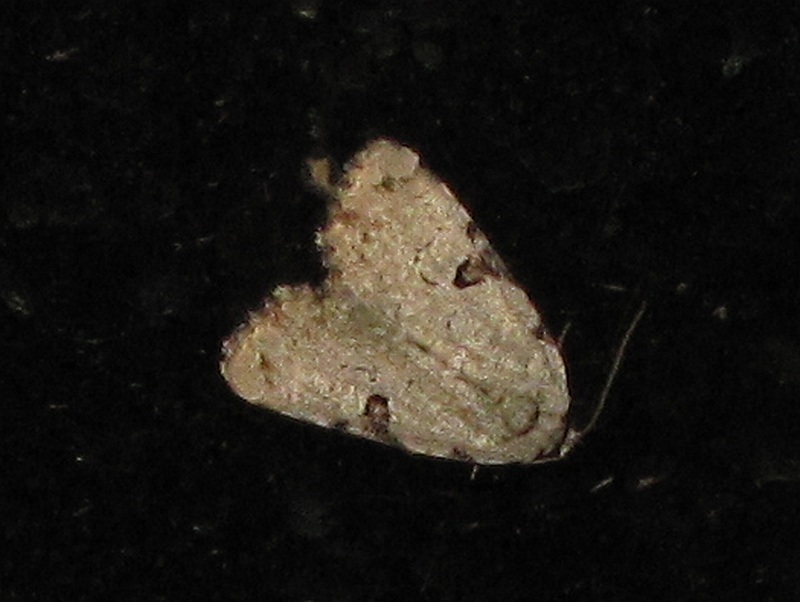 This moth clearly seems to resemble something other than a moth, exactly what is less clear. The creekside is spotted with Alders such as this one (whose young catkins are just dropping into the upper righthand corner of the photo). 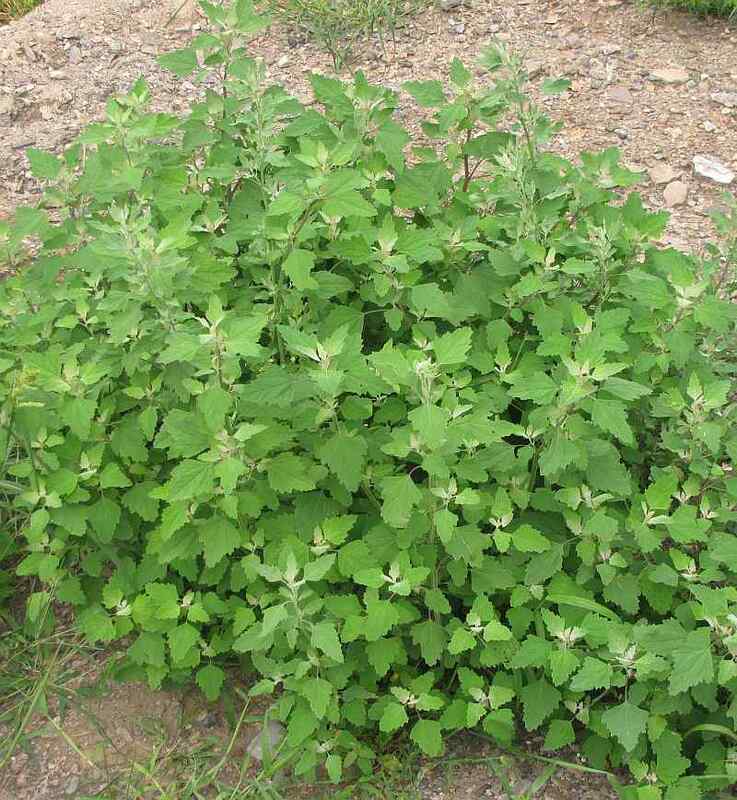 Lamb's Quarters or Chenopodium. 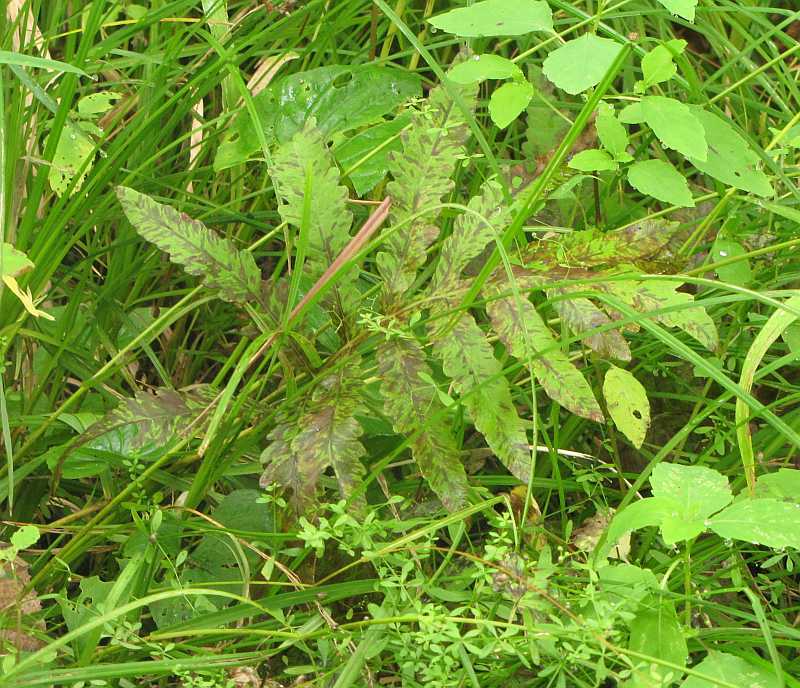 There are several species of Chenopodium in the Northeast. Some are European imports. 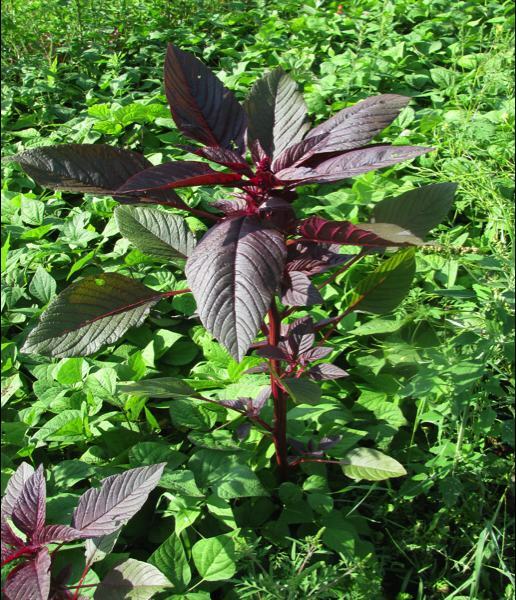 Other species however are native and were important food plants for Native Americans; quinoa, for example, is in this genus. 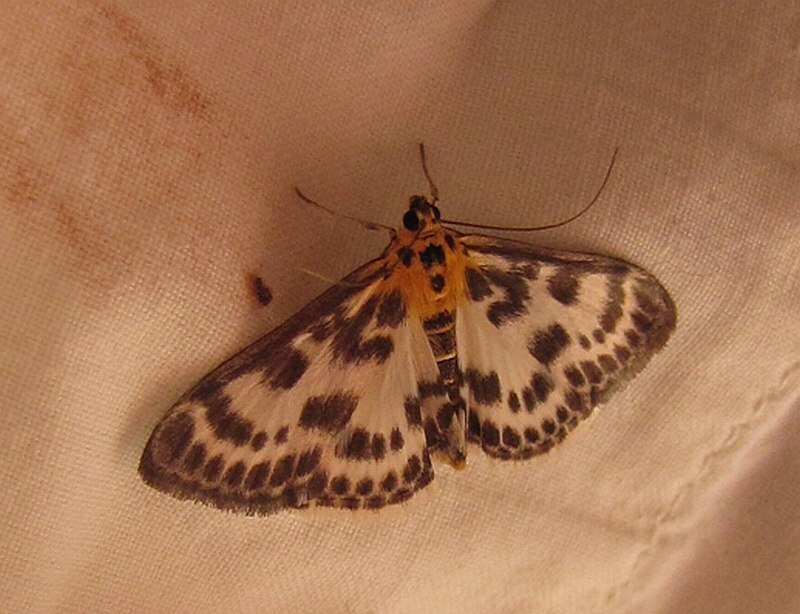 Most of our moths (and their caterpillars) pass their lives out of sight from many of us. A fate that may have allowed many to suffer the incidental wounds of our pest control efforts, habitat destruction and climate alteration. 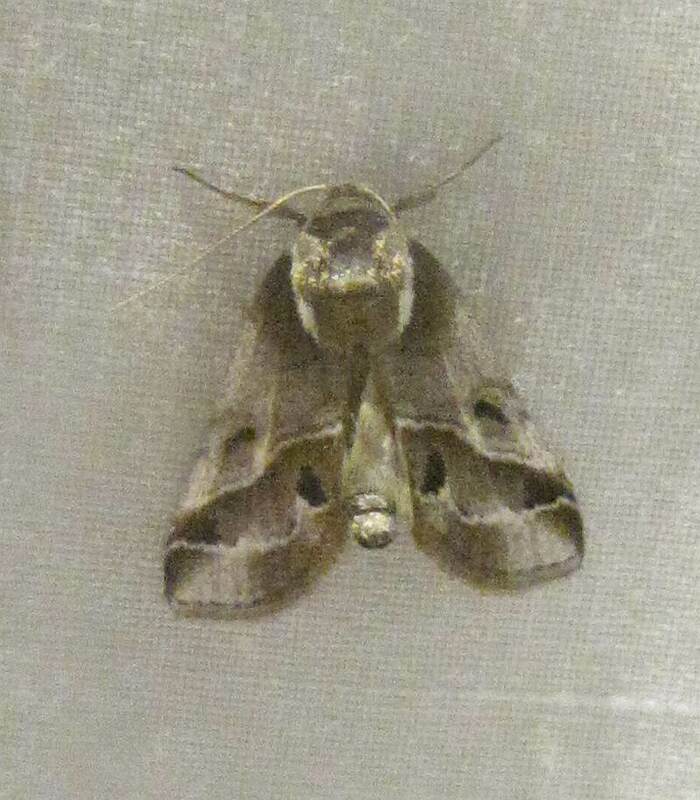 However, the Armyworm is probably better known than many farmers would like. 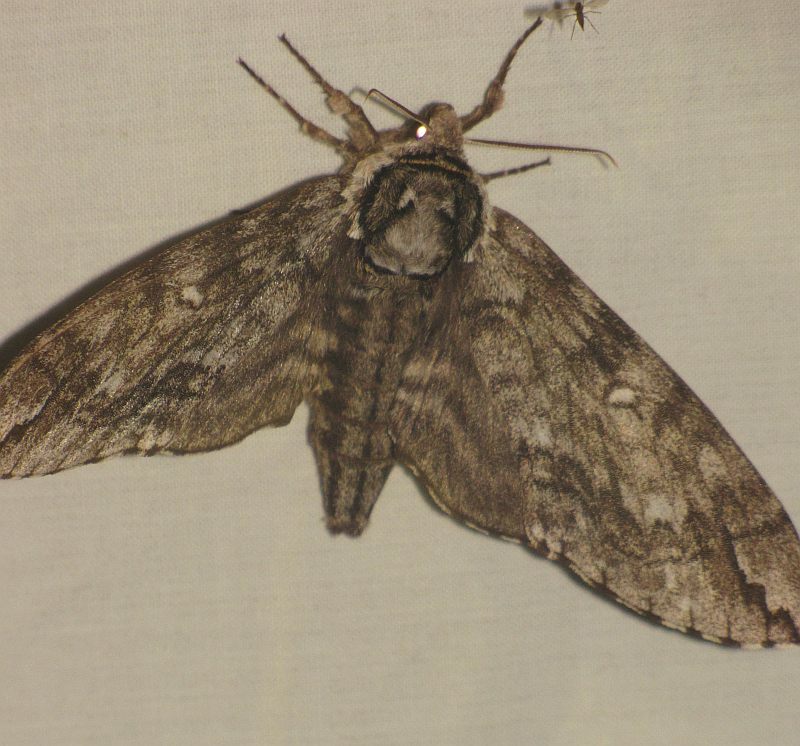 After eating its share of crops, the Armyworm metamorphoses into this moth which is known as nothing other than the Armyworm Moth; I suppose that is what happens when your caterpillar (or "worm") is so active, and (unlike the Wooly Bear) your moth is so non-descript. 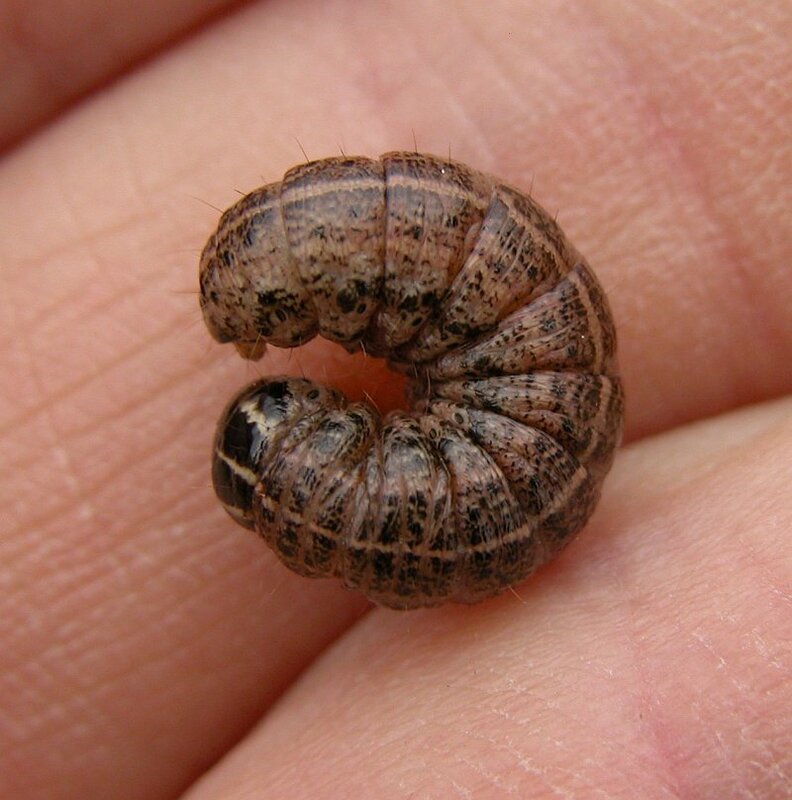 Armyworms are polyphageous, living on a variety of crops and non-crops including some woody plants. This species seems to have a generalist lifestyle that lets it make do in a range of landscapes. 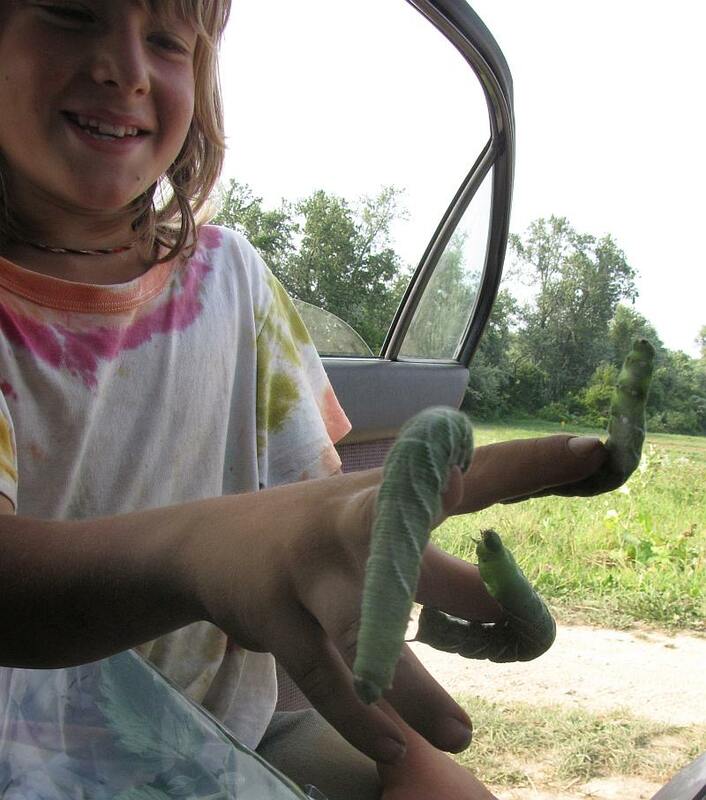 Trained hornworms... the next great pet fad. Farmers would be glad if their hornworms got poached for such use. 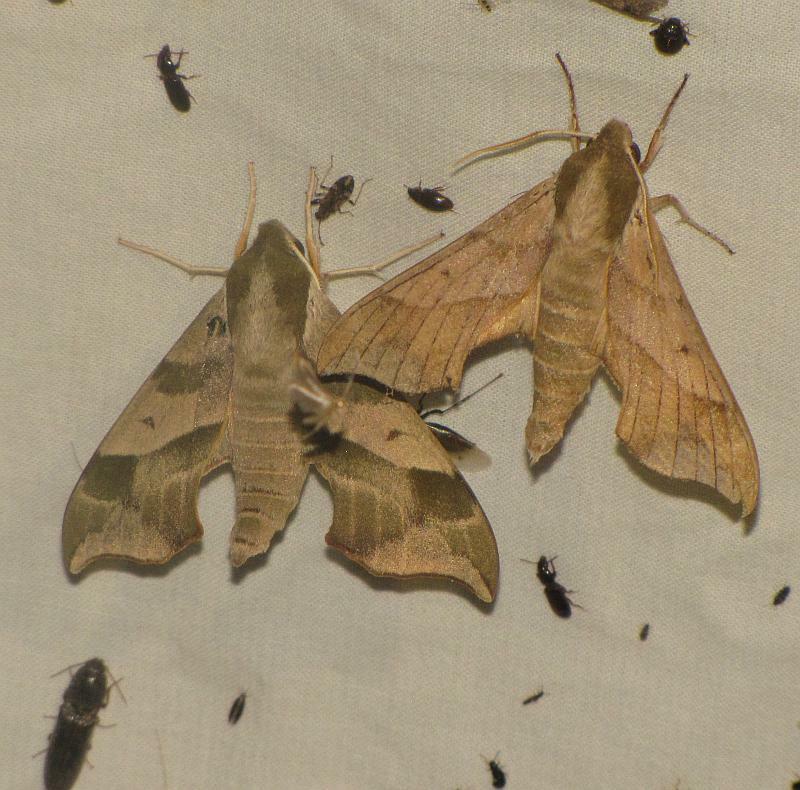 Tomato and Tobacco Hornworms are the Tomato-family feeding caterpillars of two species of Sphinx moths, the Carolina Sphinx and the Five-spotted Hawkmoth. While we have found these caterpillars on the Farm's tomatoes, I've yet to see the adult moth - another reason to set up the light yet again tonight and see who happens by. 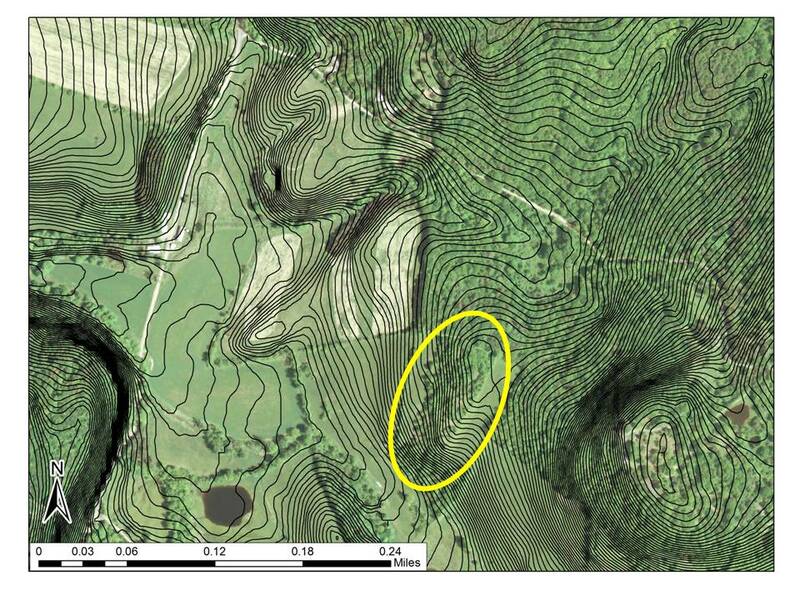 See what the site of our visit looked like from the air in 1942 or 2009. 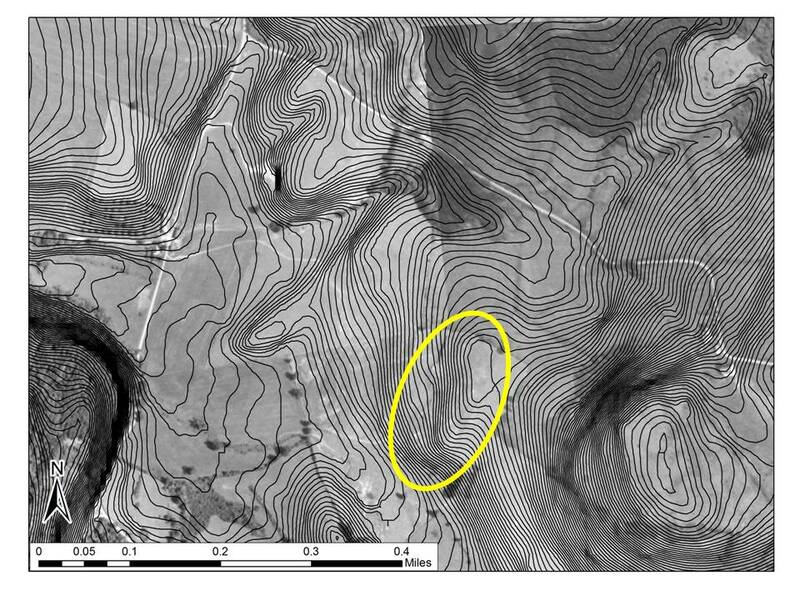 (The yellow circle indicates the location of the rocky, dry slope where we ended our outing). 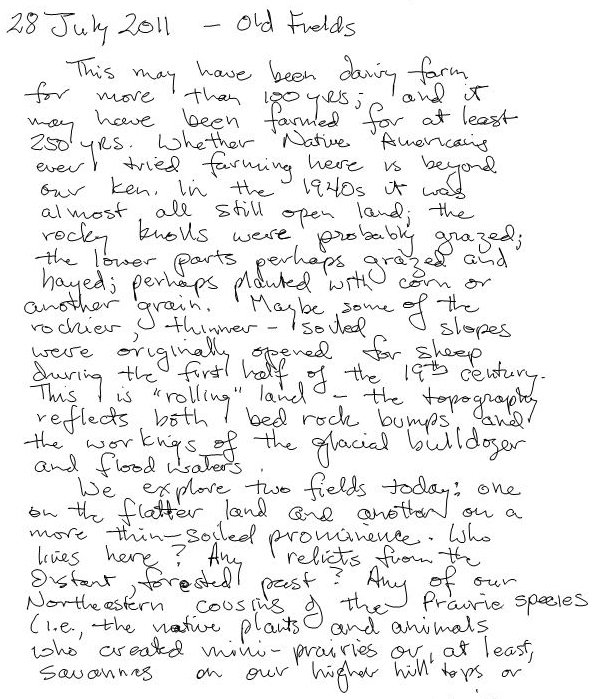 Note especially the extent of forest. What was once forest is now field with forest creeping in from the edges and from toe-holds within the fields. 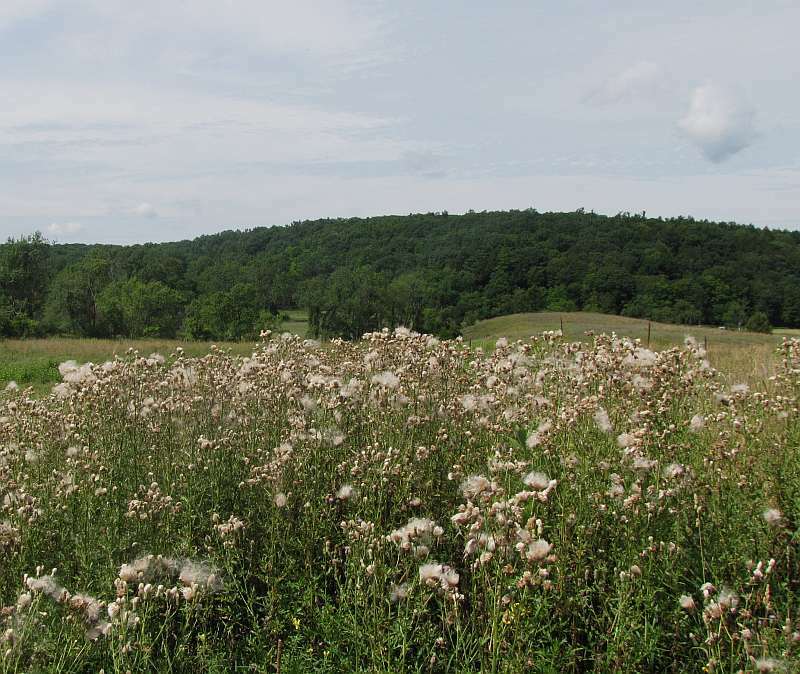 The field in the foreground is dominated by European grasses and weeds, although here and there native plants such as Little Bluestem and Milkweed appear. The thistle on the lowlands, an exotic weed, has passed from flower to fluff; the wind was carrying the tufts off like feathered balloons. 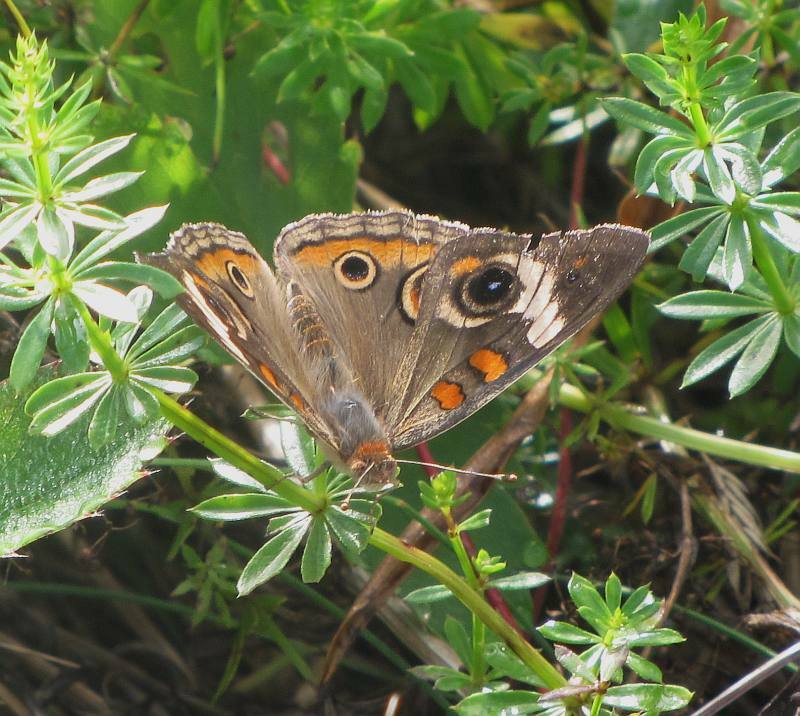 This Buckeye butterfly flitted across the field as we arrived. Buckeyes don't overwinter in our area; rather, they are migratory. In some years, such as this one, there seem to be more of them about. In other years, we don't see a one. 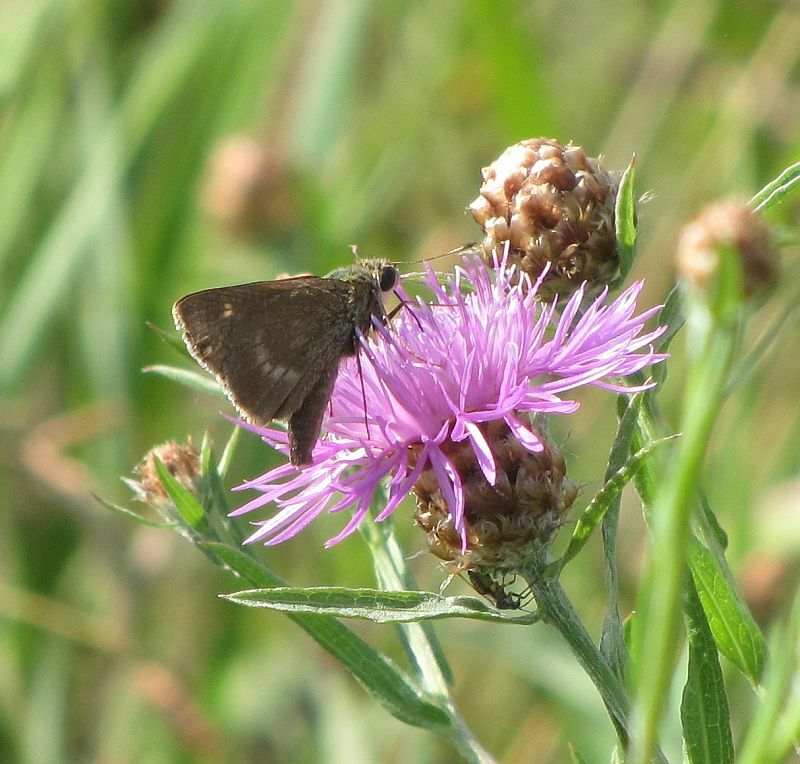 Also present are old field butterflies like this Northern Broken Dash, here perched atop Spotted Knapweed. Its caterpillars feed upon our relatively common "panic grasses". 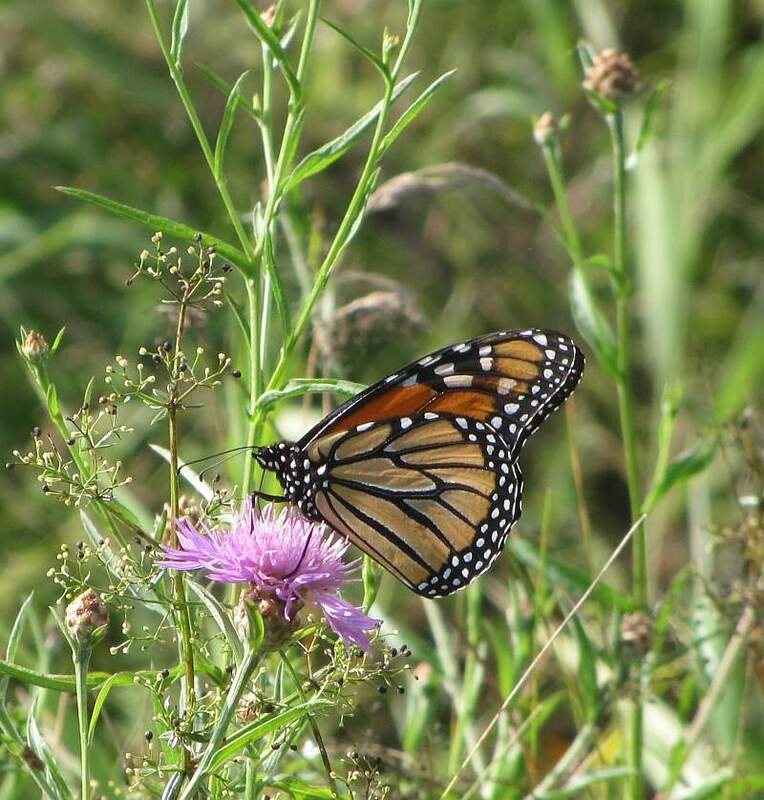 Neither those grasses nor this butterfly are very common in these fields. This Monarch caterpillar is well on its way. 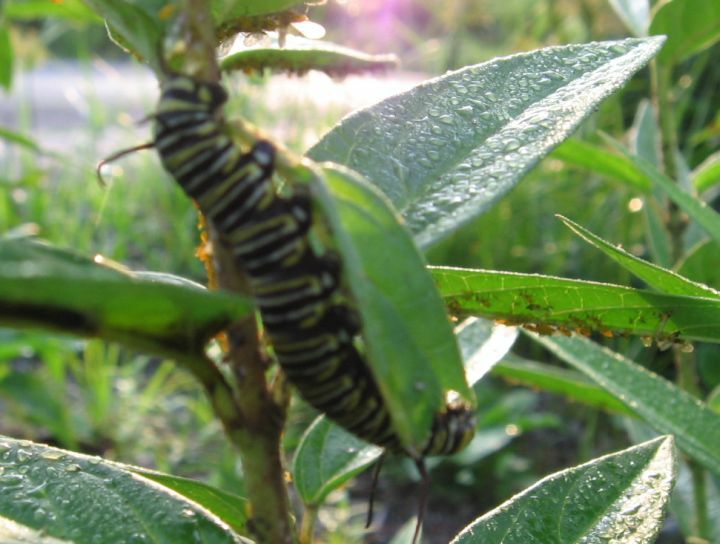 Monarchs aren't the only insects using the Milkweed. There were Black and Red Milkweed Beetles. And some plants are spattered with aphids. 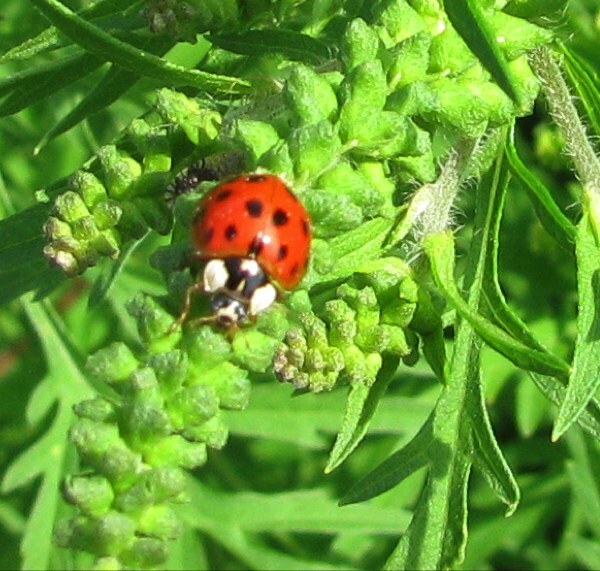 These yellow aphids are being tended by the "Somewhat Silky Ant", a common visitor to field, home and picnic. Its silvery sheen is caused by a fine coating of hairs over most parts of its body. 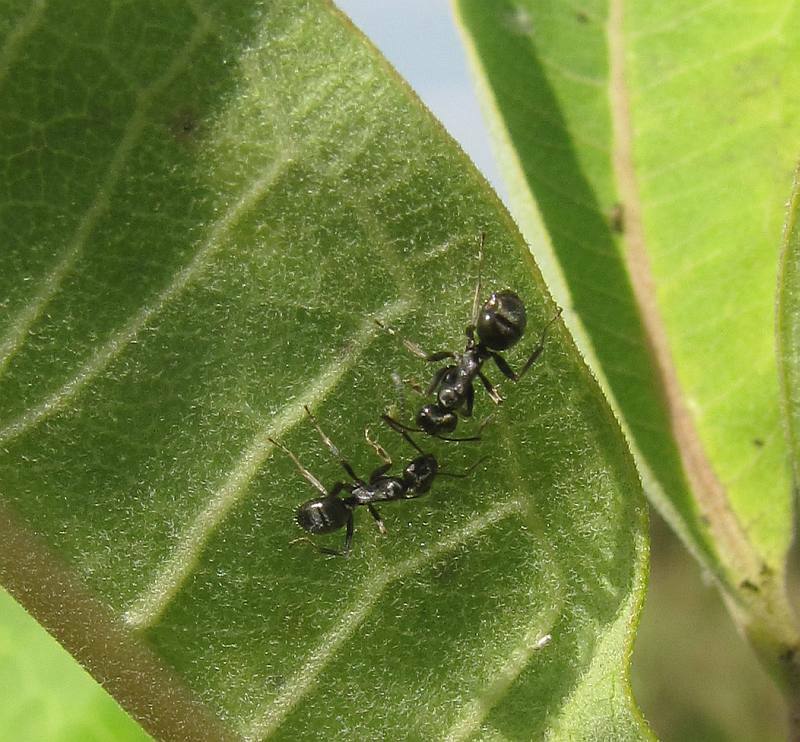 The silver sheen of the "Somewhat Silky Ant" is better seen in this photograph of two ants comparing notes on a Milkweed leaf. 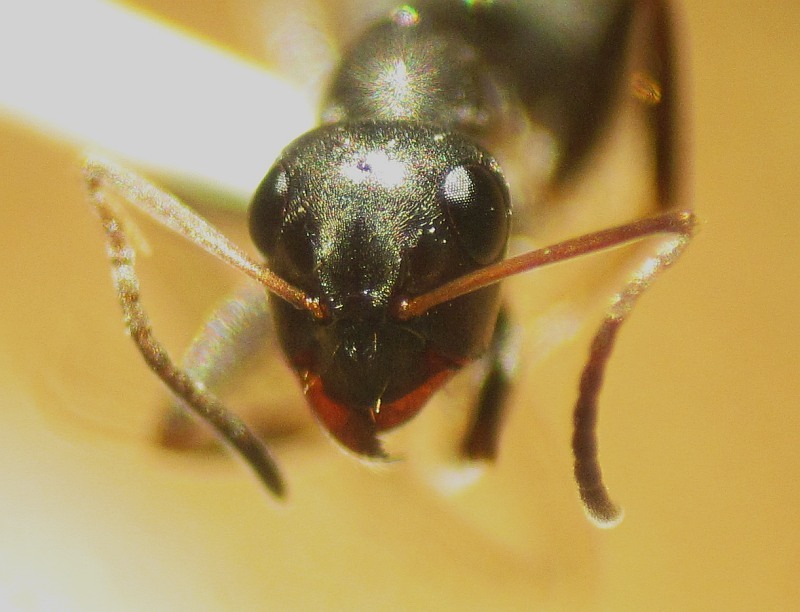 The big eyes and dark coloration of the "Somewhat SIlky Ant" are perhaps typical of ants that spend much of the day out and about. However, across our various ant species, there is much variation in body size, texture, color and shape. 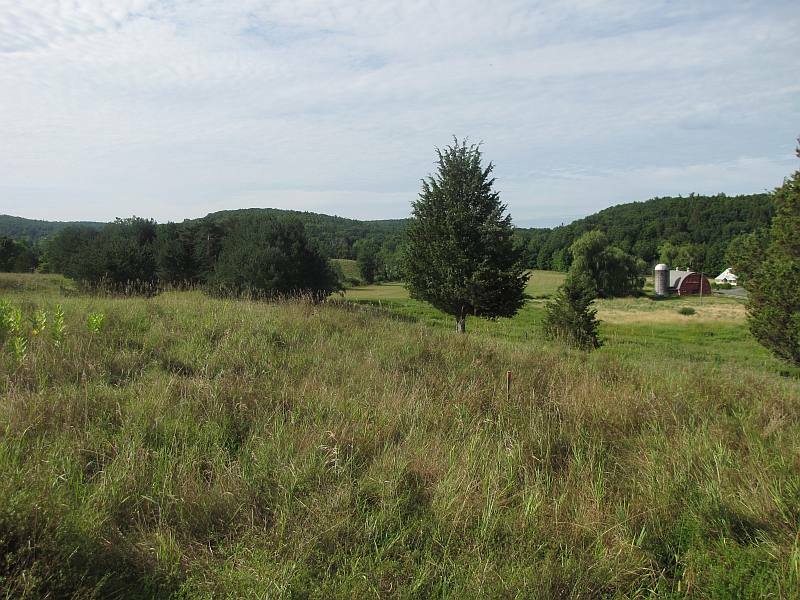 Forest edges into the field both spontaneously (when pieces are abandoned and reforest through the natural return of woody plants) and through plantings. These Scotch Pine were planted decades ago on an abrupt ridge that was probably difficult to farm. 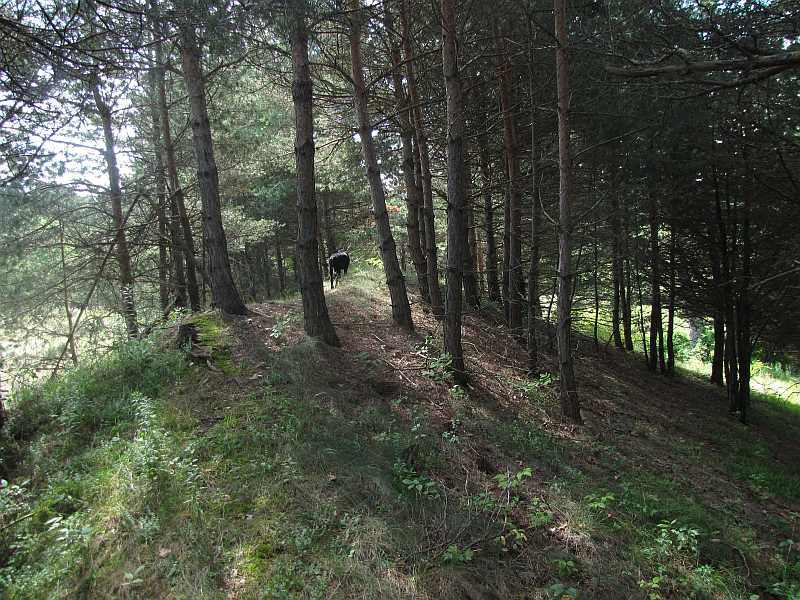 Within that same pine stand, one finds a cooler, somewhat moister microclimate (that's our dog poised in the clearing). We pick up a few forest-dwelling ants in this little pocket. 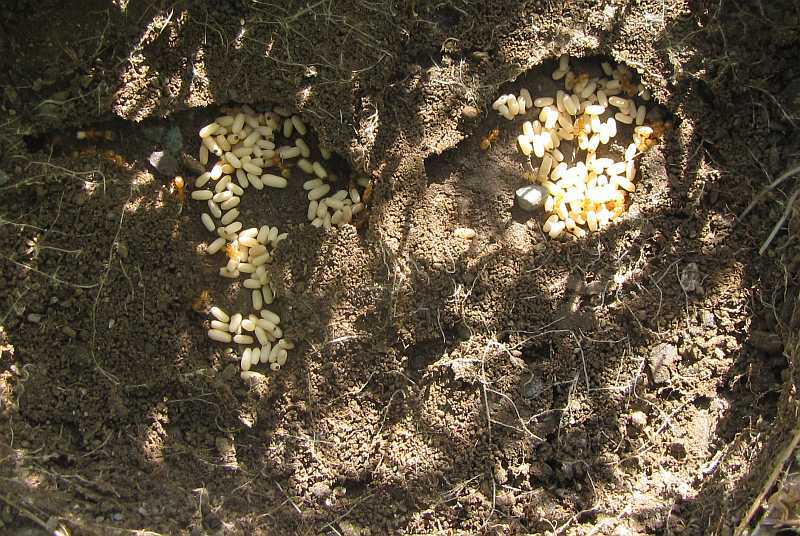 This is a "Broken-Back Ant" nest. These are generally woodland-dwelling species. Like most ants they'll eat a variety of foods (that is, they're 'omnivores'), but this group is also known to disperse plant seeds because of its predilection for the food packets that some sedges and spring flowers attach to their tiny seeds in much the same way that other plants create larger fruits, such as cherries or blackberries, which then attract birds who carry those seeds elsewhere. 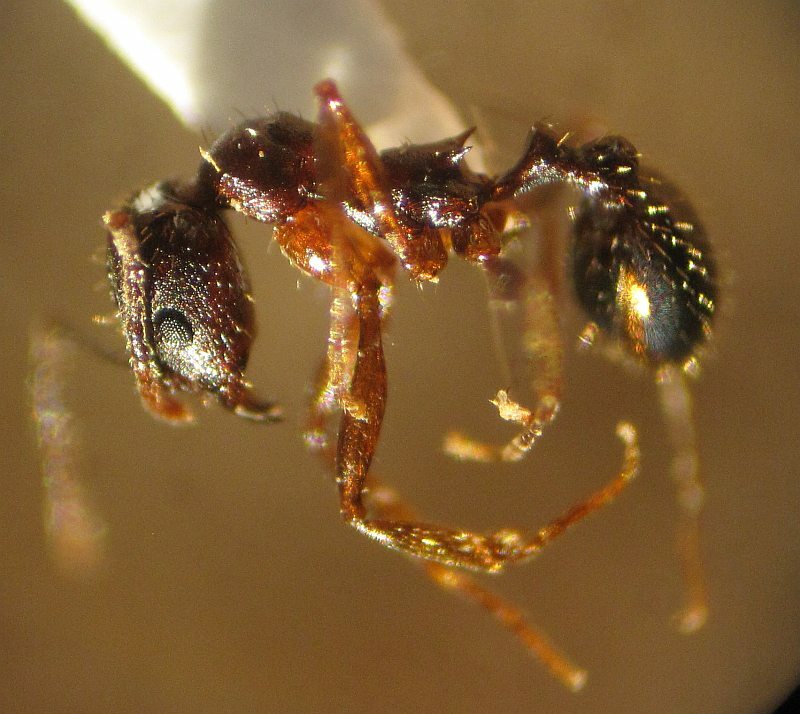 This is a "Broken Back Ant", so-called because its thorax (the part behind the head) is long and contorted. It is also armed with sharp spines, as are the backs of several other groups of ants. Some say that such spines help protect the spindle-thin waist from attackers. Who knows. Ant society does not seem to be a peaceful place, and attacks from other ants seem common, so a tendency to evolve protection against such attacks seems possible. How much poking power these relatively short spines would provide is unclear. This Sugar Maple was probably left in the middle of the field for shade. 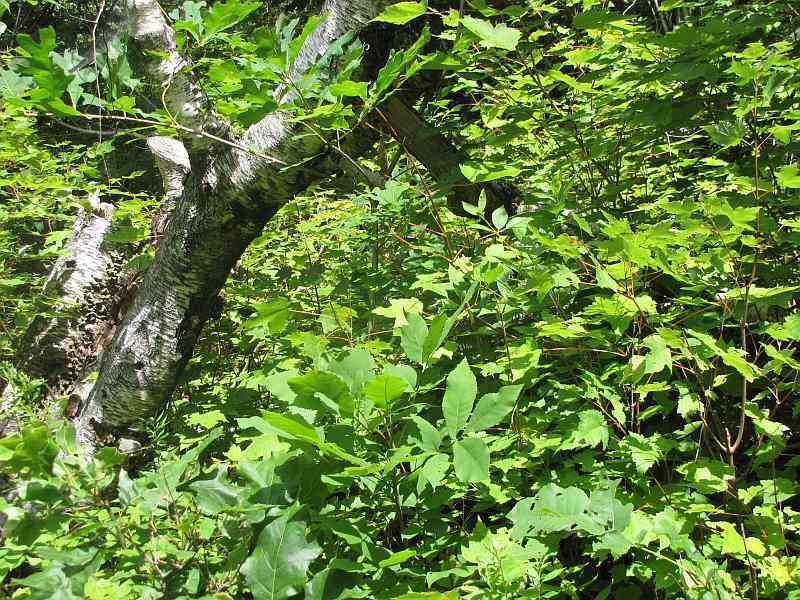 Given its distance from the farmhouse, it's hard to believe that tapping for maple syrup provided any motivation, although settlers did favor Sugar Maples, and our forest seems to have more Sugar Maples in it now than prior to European settlement. The low-hanging branches and adjacent fencerow can discourage grazers and hay makers, and form an initial 'crystallization point' for returning forests. 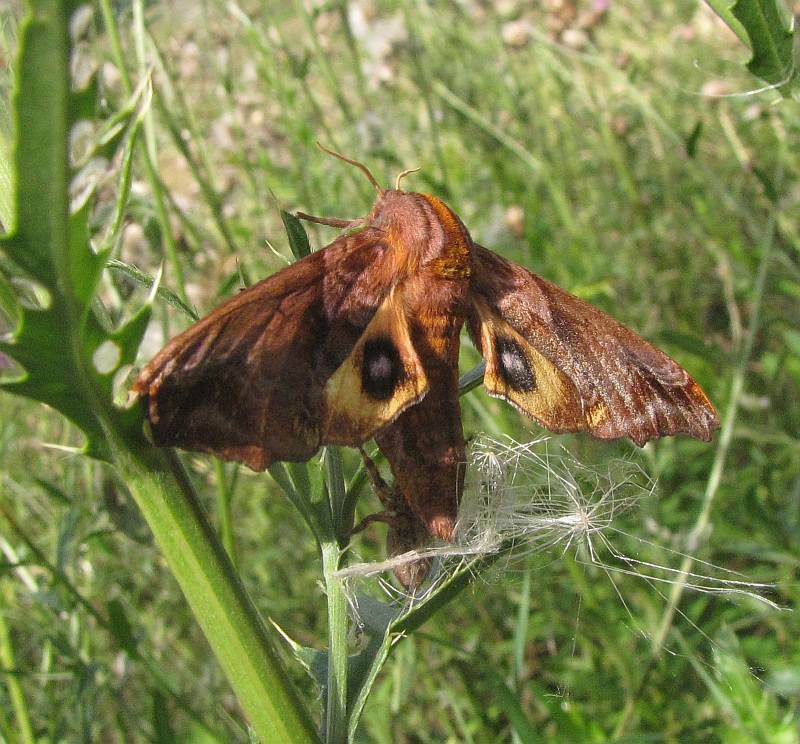 The butterflies and moths we find in these fields seem to have come in mainly for the nectar sources. 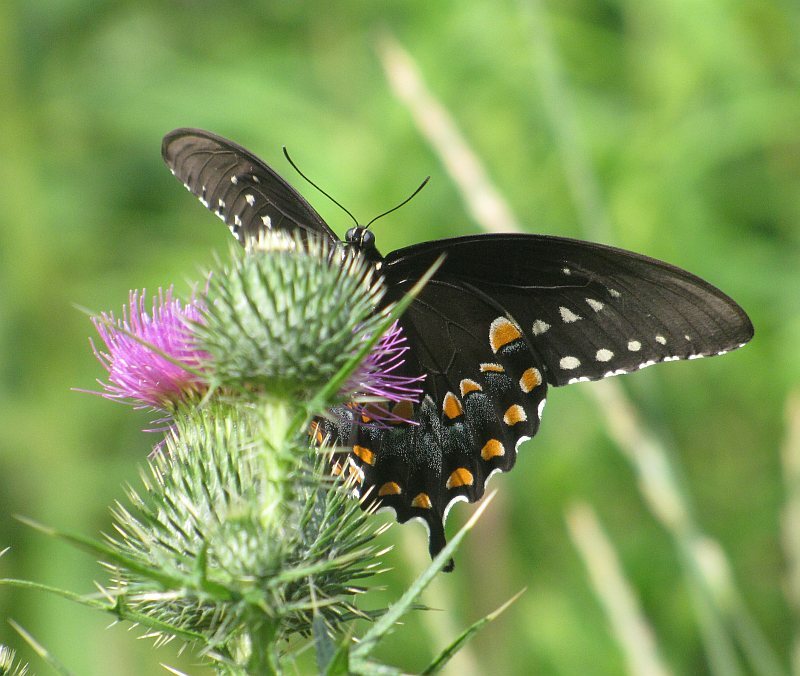 The caterpillars of Spicebush Swallowtail, here seen drinking at a still-flowering Thistle, probably feed on its namesake in the adjacent wet forest. 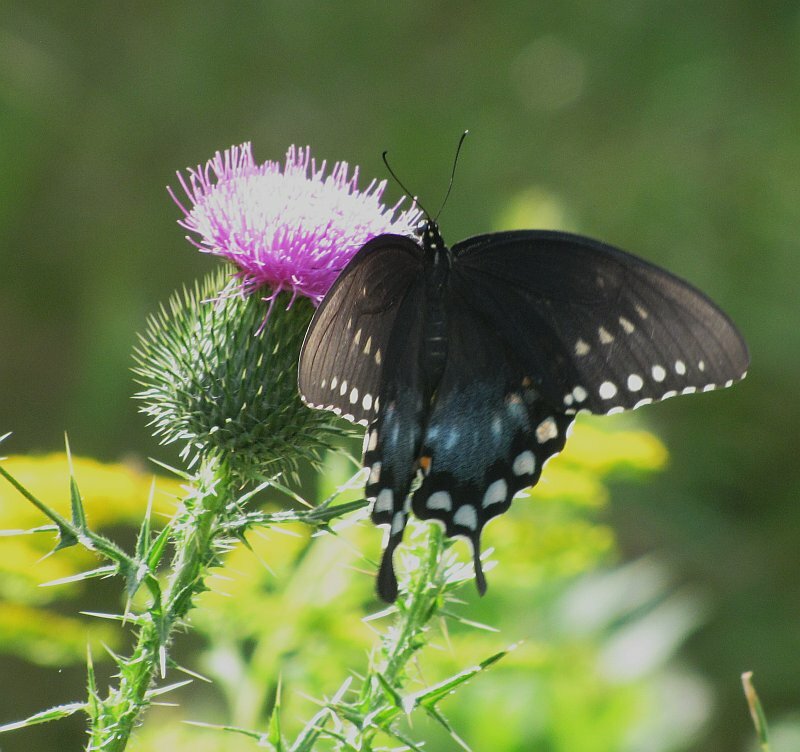 Although the Spicebush strongly resembles the Black Swallowtail, it is slightly larger and, as this wings-open perspective shows, has a larger blue patch on its hindwings and less yellow. Likewise this unfortunate Small-Eyed Sphinx, being eaten by the Jumping Spider attached to its abdomen, has caterpillars who feed on woodland plants such as Cherries and Shadbush. This rocky prominence is slowly reverting to forest. The thin soils may have been made even thinner by the work of grazers' hooves which sloughed the delicate mantle of dirt off of the smooth bedrock. Left to its own devices, this area supports many of our native plants. These are more adept at living on such lands than the European plants brought over to grow in rich gardens or farm fields. The tall, bright green grass to the left of the rocks is Little Bluestem. 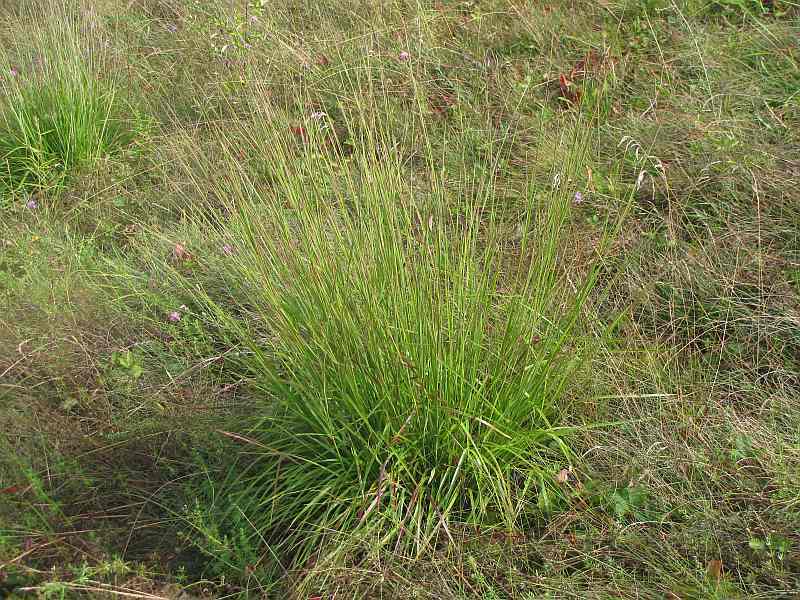 Little Bluestem grows in discrete bunches and is a 'warm season grass' meaning that its most exuberant growth occurs relatively late in the summer when many of our other grasses are beginning to look more 'tired'. In autumn, it will add a beautiful almond haze to this hillside. 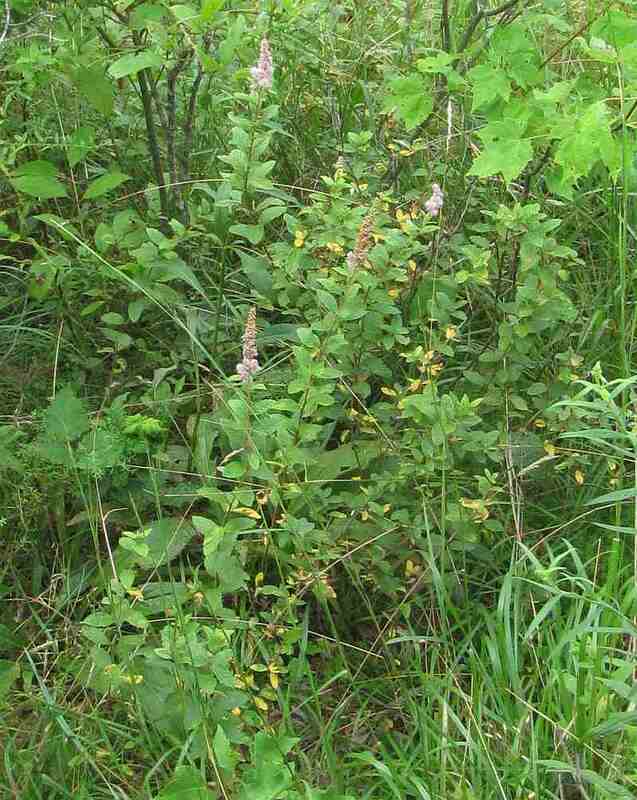 This Spirea, Steeplebush, also grows in the rocky 'savanna' (savanna refers to an area where woody plants are interspersed with large areas of more open lands). Meadowsweet, a white Spirea, grows nearby here; both are native to our area. "Sweetfern" is, in fact, no fern at all. 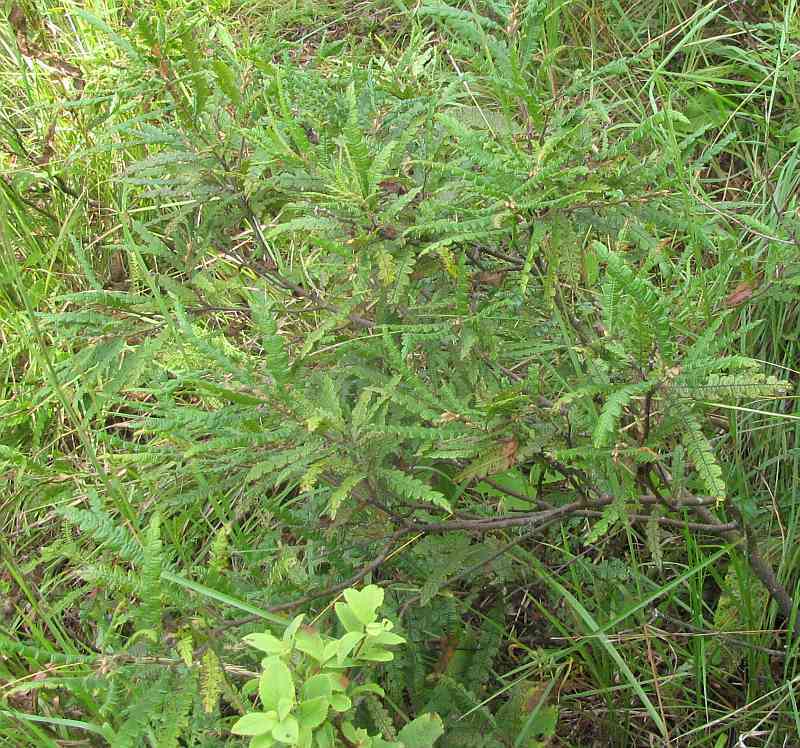 But it does have fern-like leaves and when those leaves are crushed, they are sweetly aromatic. 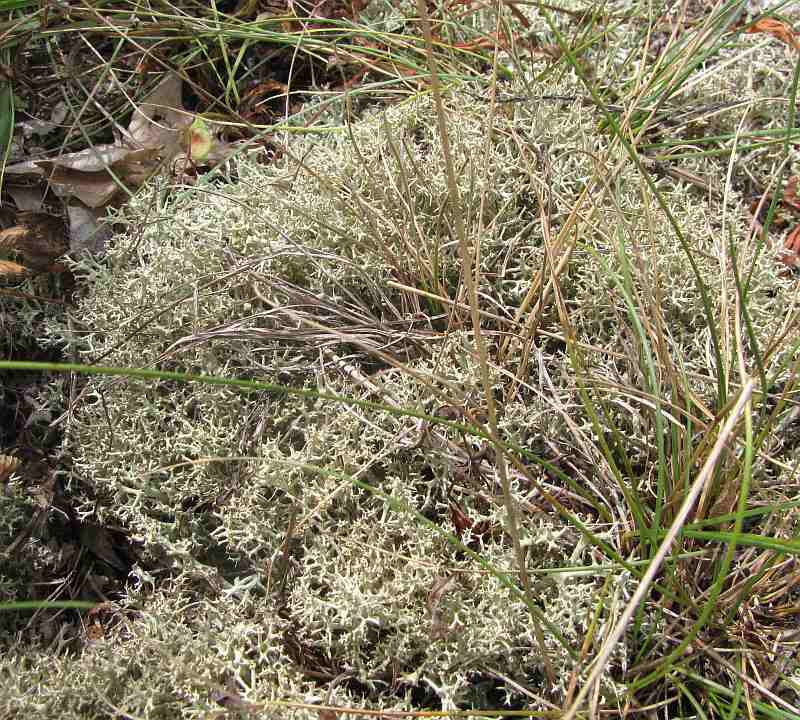 Reindeer Lichen (so named because reindeer reportedly eat a tundra relative) grows thick and brittle on the rocks. 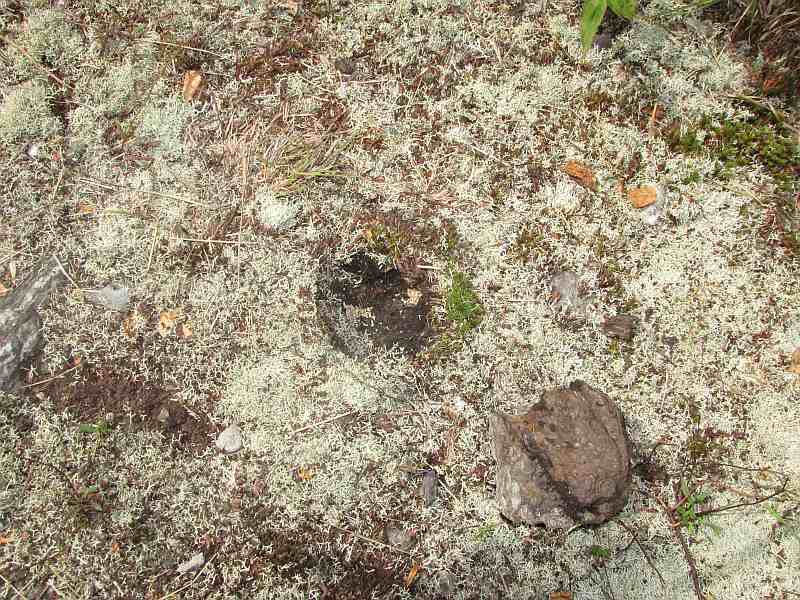 Nestled in one clump of lichen was this ant nest (the rock that covered it has been put to one side). The nest in the previous photograph and the one in the photograph here are of small "Lasius" ants. These ants apparently live most of their lives below ground, tending and 'milking' various root-dwelling insects. 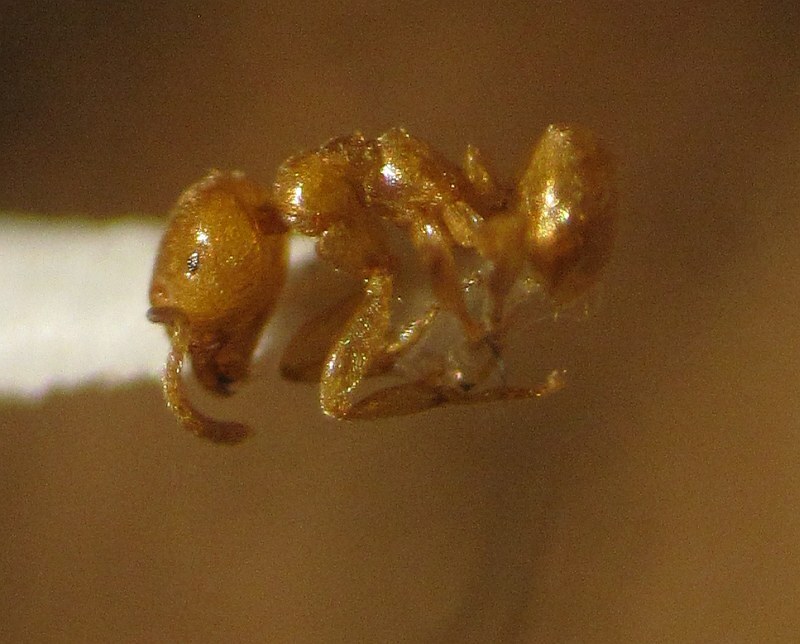 As perhaps befits their underground life style, Lasius tend to be paler ants with relatively small eyes. At least one of Lasius species is holarctic meaning that it naturally occurs in both North America and Eurasia. These red and black "Formica" ants are common midst the rocks and dry vegetation (indeed, in our neck of the woods, ants generally seem more common in dry areas; somewhat the reverse of ground beetles). There are various kinds of such ants, but almost all are raiders of other ant's nests or frequent victims of such raids. 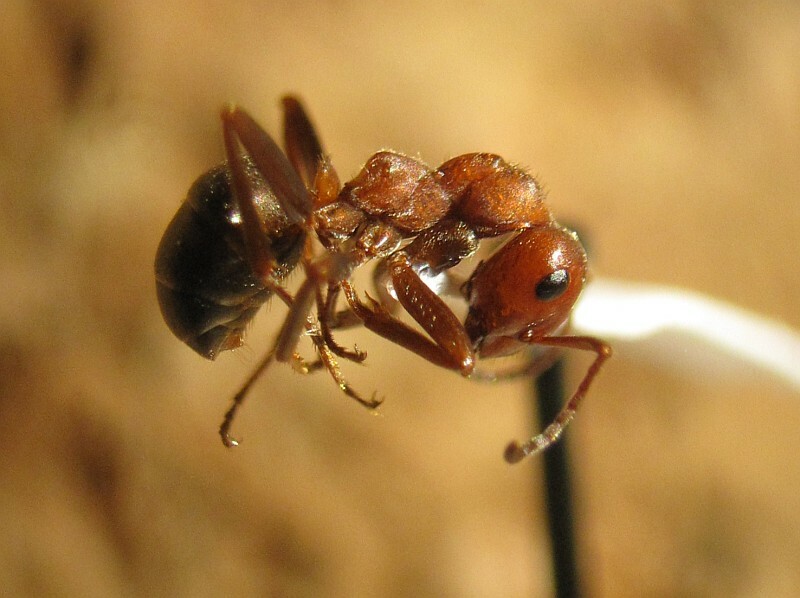 Apparently, the majority of such raids are in search of forced recruits to the ranks of the raiding nest's workers, rather than attacks for food (although that happens too) or attempts to oust other ants from preferred nesting sites. 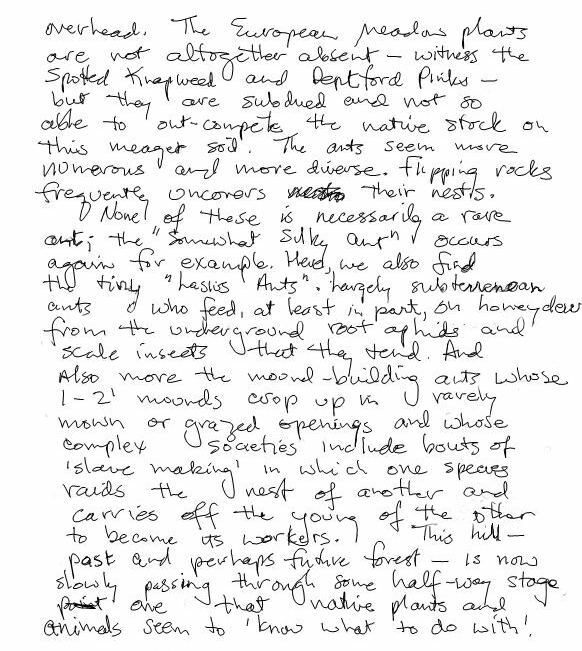 Many of these are 'mound building' ants such as those also mentioned in our 13 May 2011 blog entry. Compare the profile of this ant to that of the "Broken Back Ant" pictured earlier - there's a lot of room for variation in the architecture of what we just generally describe as 'ant'! This is the mound of one such ant, albeit from May and from Hawthorne Valley itself. It is however located in the same kind of dry, rocky habitat. 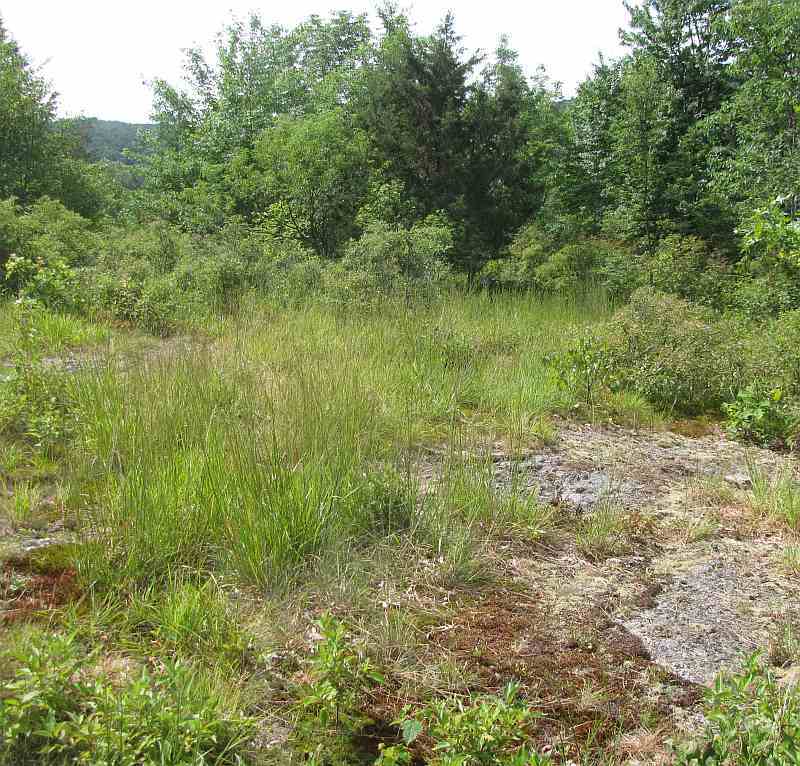 The choice of such habitat may be due in part to the fact that it tends to stay open (due to the rocks) and yet is rarely subjected to the intense mowing or grazing that would quickly destroy the mounds. 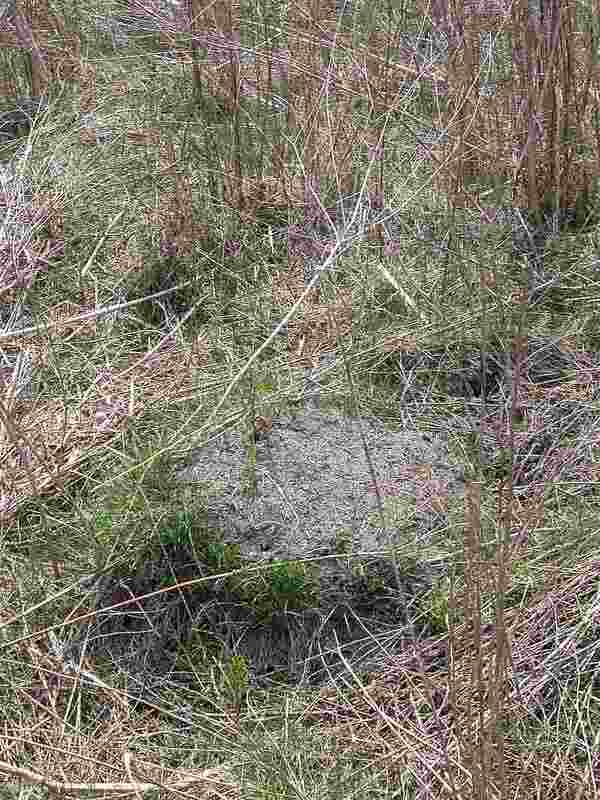 That said, many mound builders can and do make less conspicuous nests. Aside from the ants in this 'savanna', some of whom are generally described as forest-dwellers, other insects also hint at a woody future. 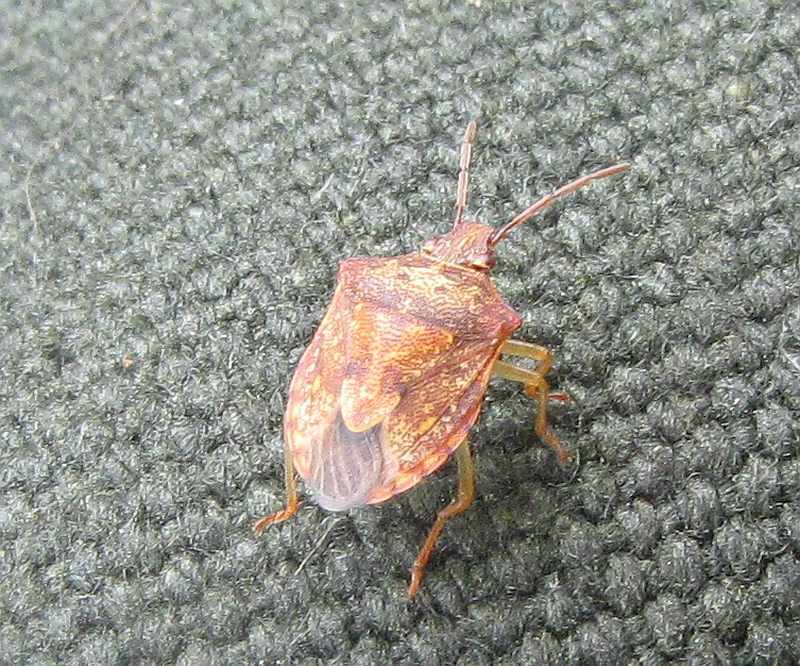 This Brown Stink Bug, pictured here on the somewhat unnatural background of my backpack, apparently feeds most commonly on oaks. 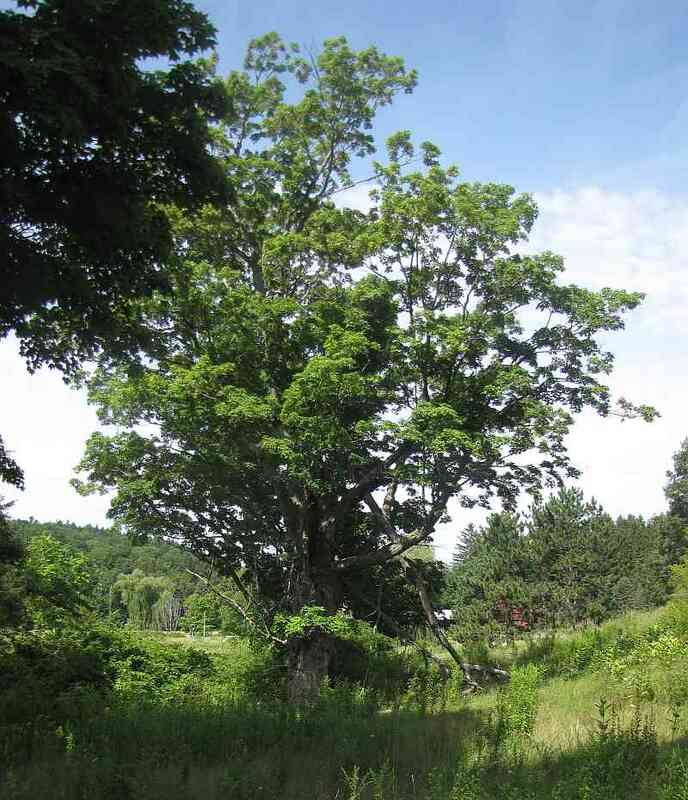 Perhaps including trees such as this Black Oak found nearby. 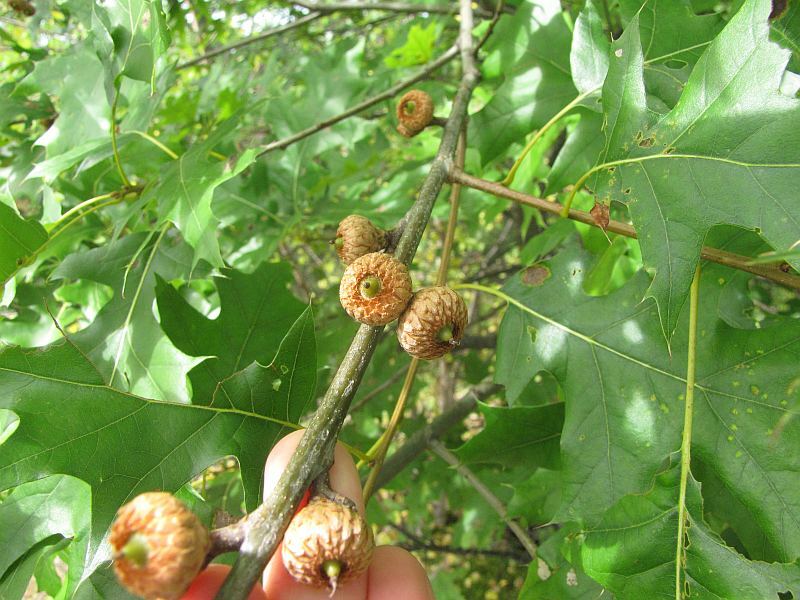 Black Oak seems to occur in dry forests in our area - not as dry perhaps as where we find Chestnut Oak, but not as rich as prime habitat for White Oak or Red Oak (although both of these species were also in the neighborhood). The future for this dry knoll? 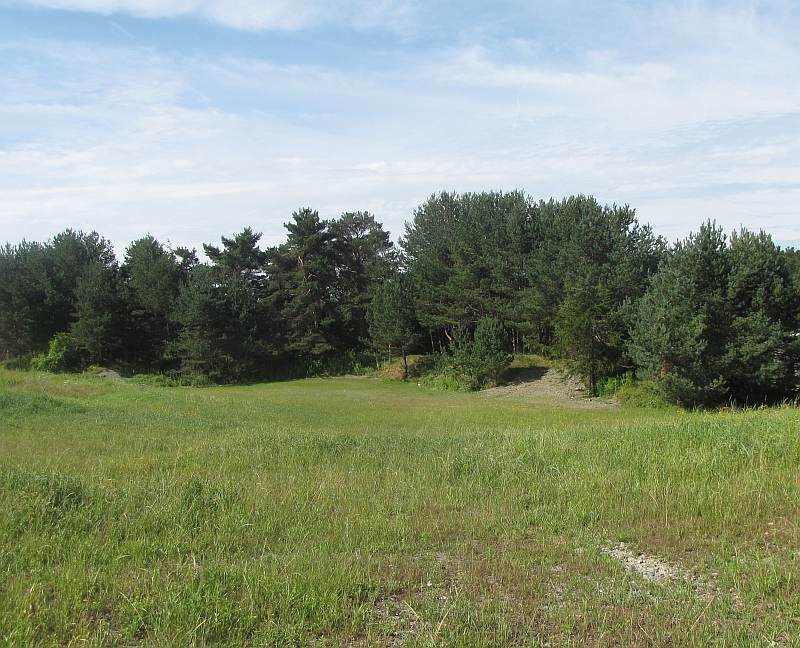 This shot, which looks like a green mish-mash, is full of some of the trees that may come to dominate. The Birch, whose gnarled trunk suggests senescence, may have come in when this was first abandoned open land. As the forest thickens, the Birch will probably give way to trees such as Shagbark Hickory, Red Maple, and those White or Red Oaks; all species who seem to have saplings in the foreground of this picture. Or perhaps, if some level of grazing is maintained by livestock or deer, or if a rare grass fire burns through, then the savanna and its ants and plants will persist for a bit longer. While much of this blog was put together with ingredients from the sun-drenched fields, some of it happened here. 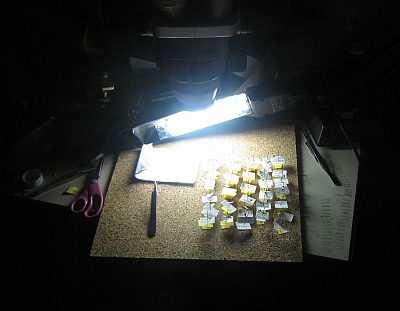 At my nighttime desk, beneath the microscope, the only place where I can really get a good look at those ants, put names to them, and hence, add another ecological color - or level of understanding - to this landscape.